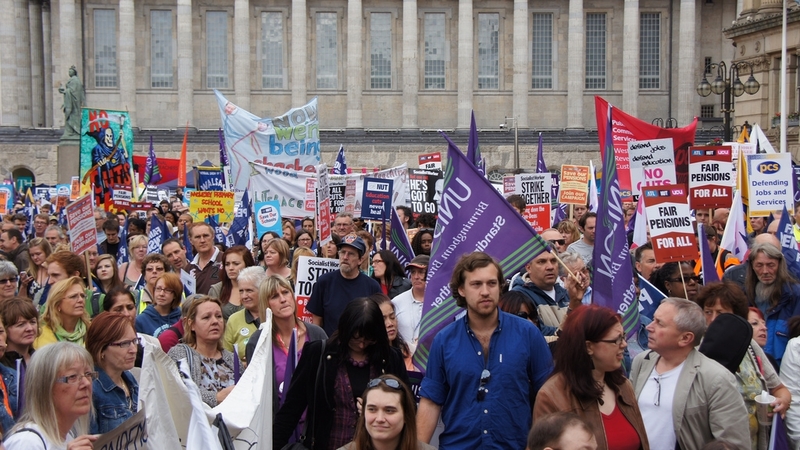 Birmingham against the Cuts gives 100% support to today’s public sector strikes. 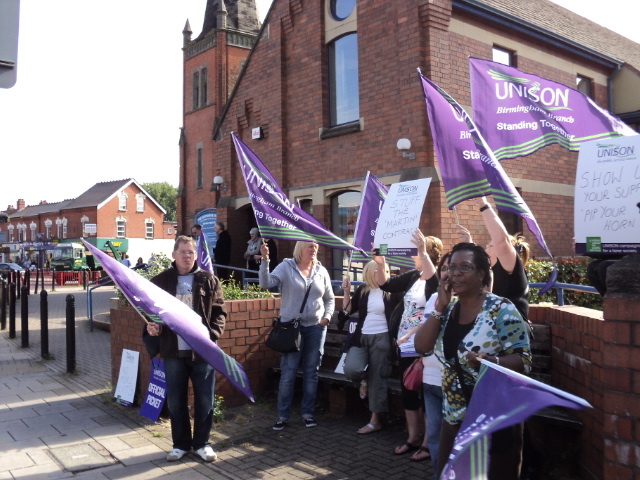 It’s disgraceful that staff delivering vital public services in our Schools, jobs centres, nursery’s, nursing homes and hospitals are having their pensions cut and being made to retire at up to 68. 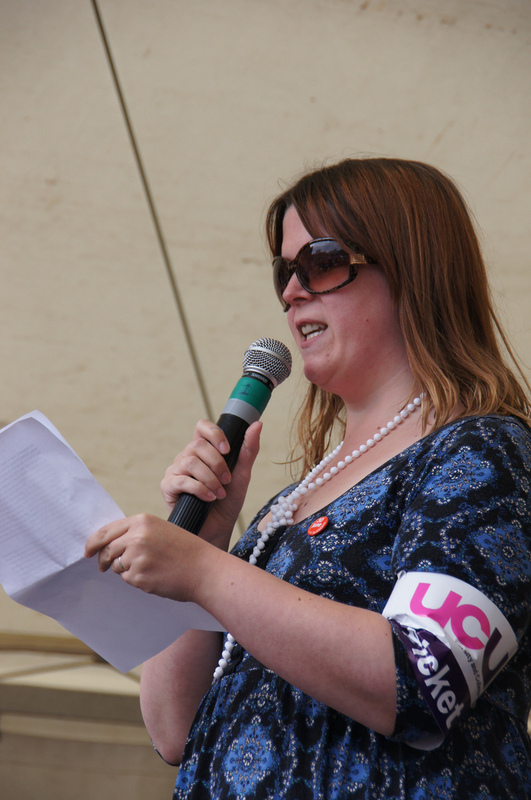 These proposals disproportionally affect low paid women workers. 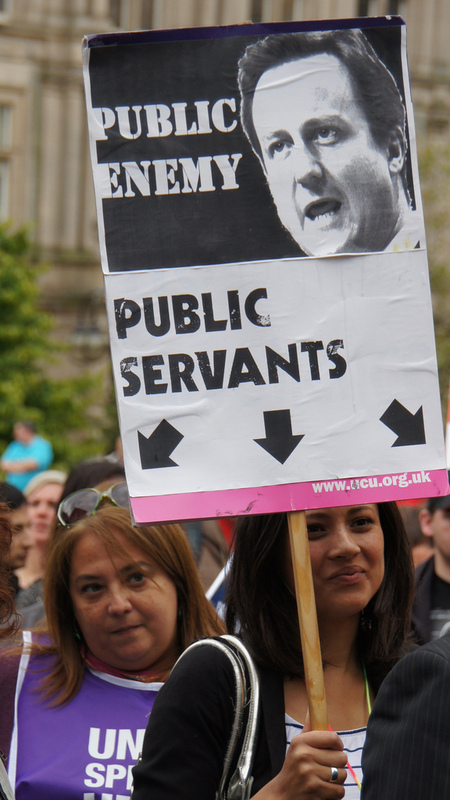 The Public Sector workers didn’t cause the economic crisis, the bankers did. These same bankers can retire at 55 on a fat cat pension whilst low paid staff in the public sector will be forced to work to 68. The government should drop these proposals immediately. 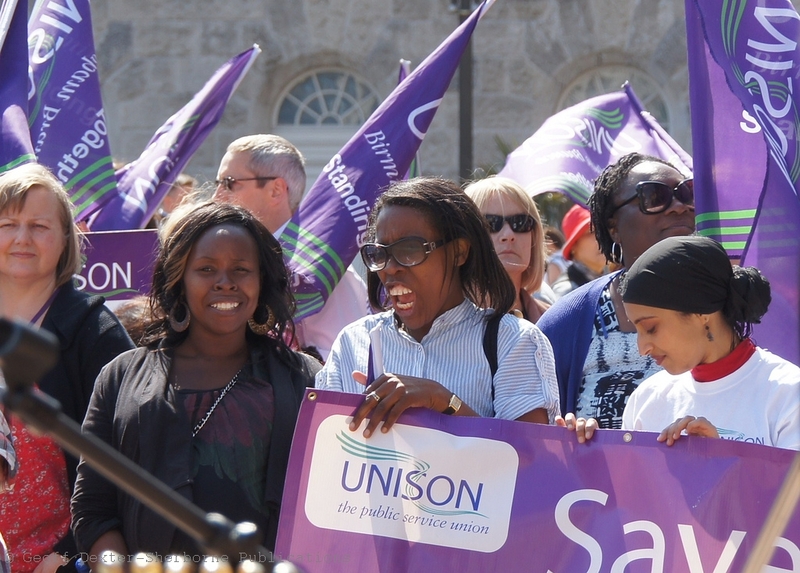 By 49% to 35%, people agree that the workers have a legitimate reason to strike, and people believe, by 46% to 35%, that the Government would be wrong to change public sector pensions if most workers affected oppose them. 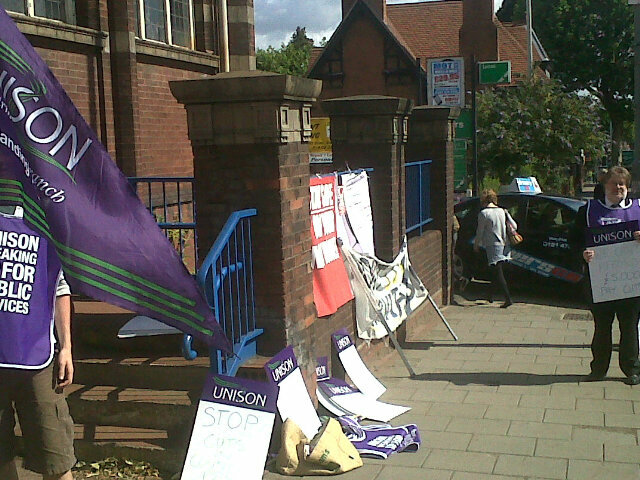 As a single working mom of two young children I may have to loose a day’s work, some local nurseries are being closed to support the strikes. 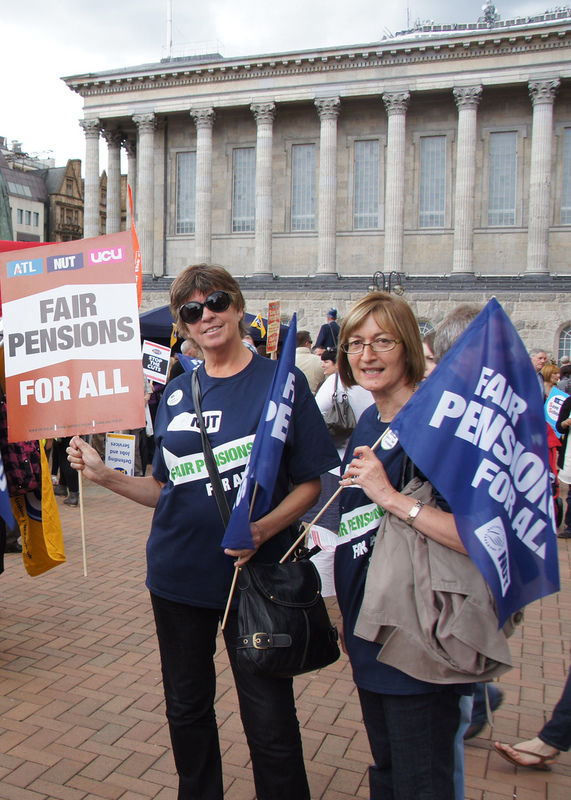 I fully support Thursday’s strike action and think the Government need to rethink their approach to pensions and fair pay as well as treating public sector workers better. 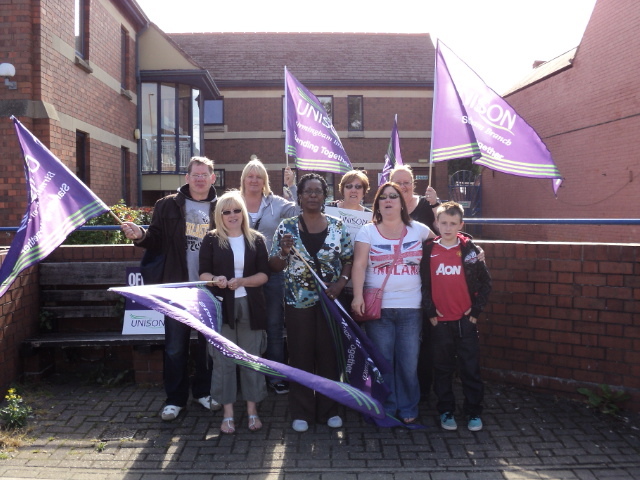 Why should nursery workers work longer for less pay? 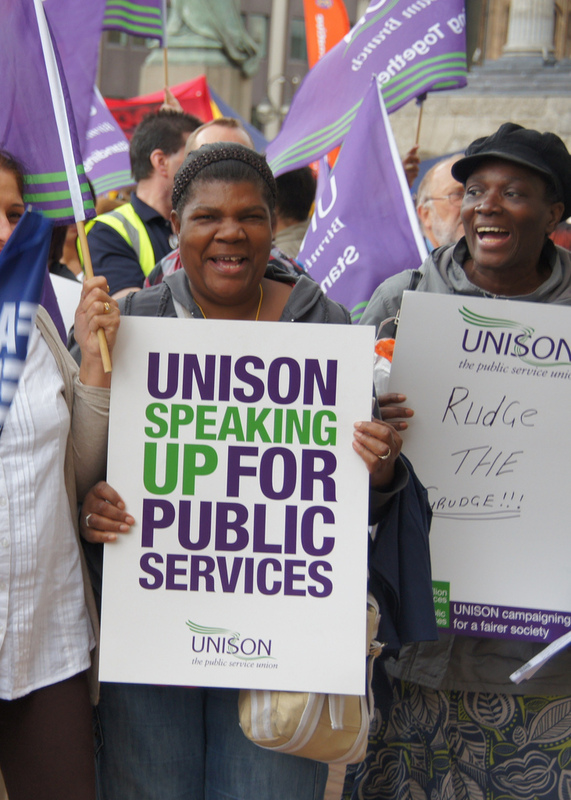 Why is it always Public Sector workers that suffer? These are people we count and depend on like our teachers, our nurses etc. 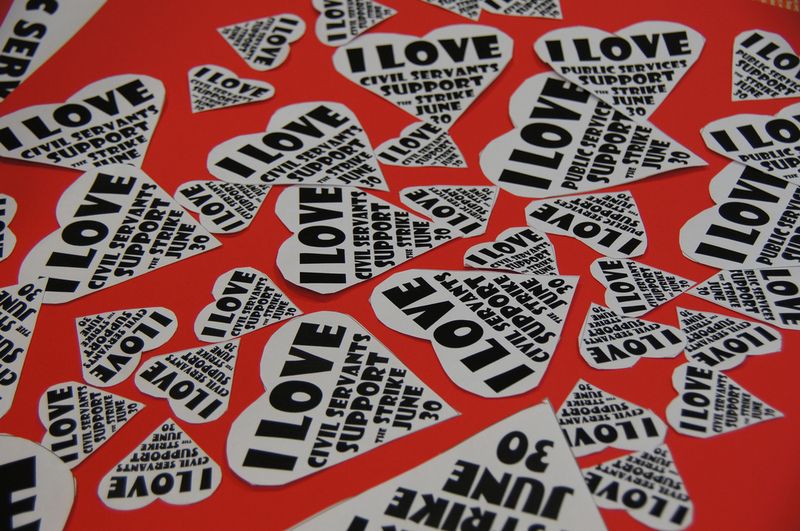 The people who play the most important roles in our every day lives. They need to be treated better and have a fair deal. I have to sign on every week at a job centre after losing my job last year and now face having my benefits cut. 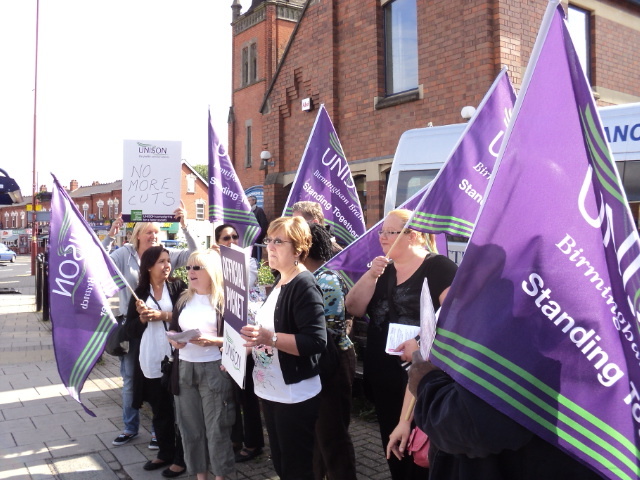 I’m fully behind the job centre staff striking tomorrow, why should the same bankers that made me lose my job get to retire at 55 whilst staff trying to help me get another job are being made to retire at 67 or 68 on a worse pension? As the parent of a 6 year old whose school will be closed tomorrow I want it to be known that I fully support the actions of the teachers and public service workers who are standing up to defend their pension rights. I don’t want to see teachers being forced to work until they are 67 or 68, how does that help our kids education? 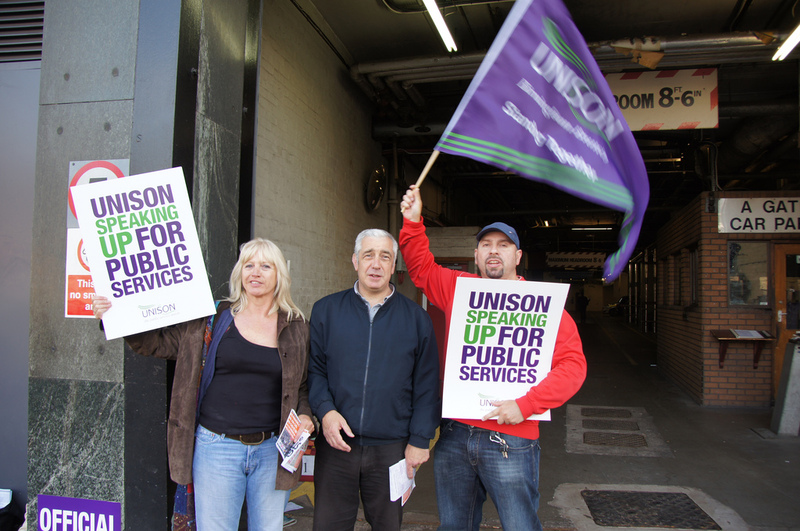 We should all be doing is getting behind the strikes and fighting for a decent pension for all workers. Not trying to erode the pensions of the minority who still have a degree of security in their retirement. 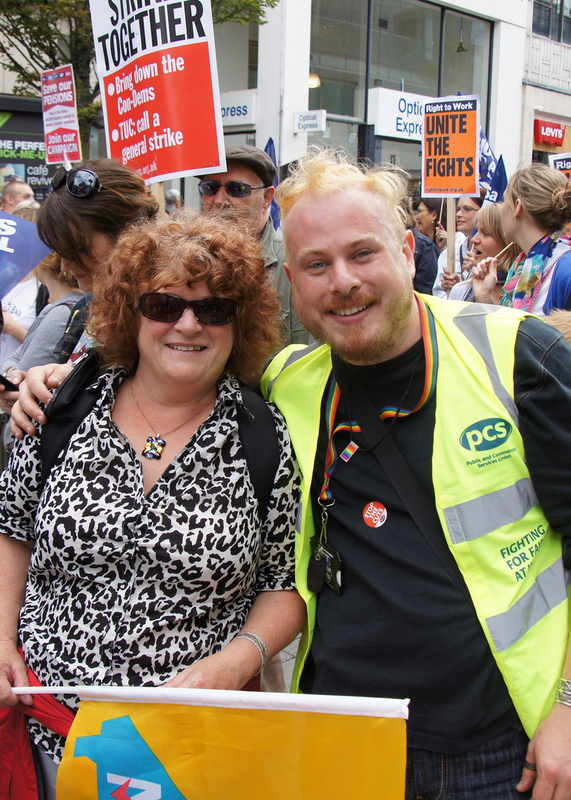 As a child of a single parent and user of public services I feel it is vitally important to support the strike action of Public Sector workers against the austerity measures of the ConDem coalition who control both the City Council and Parliament. I know that these cuts are going to hit hardest the most vulnerable, like my family and the staff that provide these services. 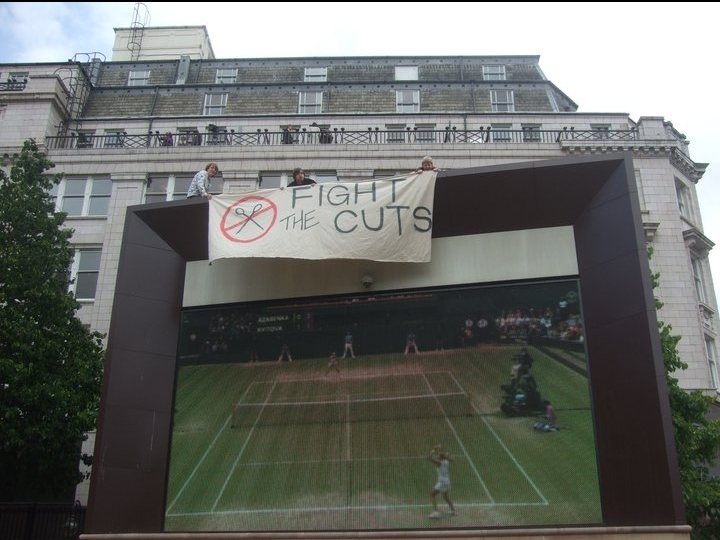 The proposed cuts to children’s services and leisure facilities will lead to the closures of youth groups, libraries and swimming pools and will damage the mental and physical well being of our most important resource, children. These are just a few residents, and we need to show the strikers that this city is behind them as they seek to defend our services and their jobs, pay, conditions and/or pensions by taking direct action against this government and their austerity agenda. 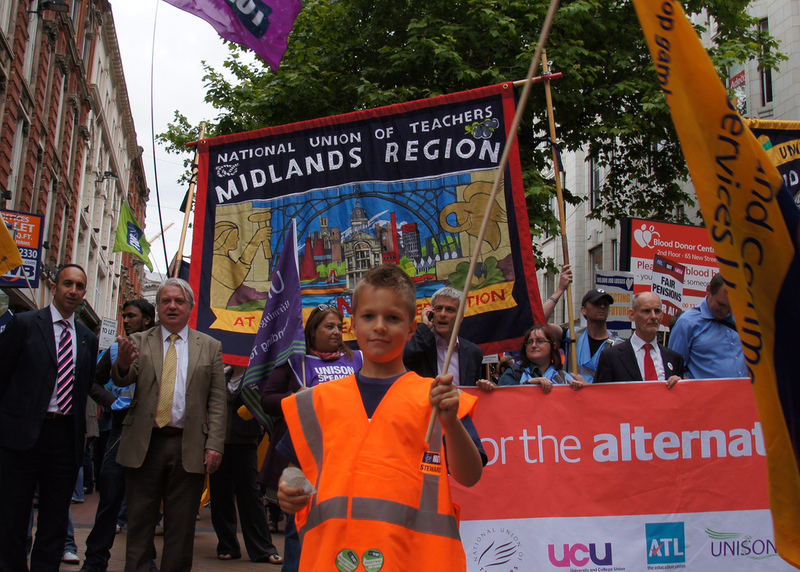 Today could be the biggest day yet in the struggle against the cuts, so make sure you get out and show your support by visiting a picket line, joining a demo and/or going to the strike rally at 12 noon in Victoria Square. This page has a map showing the location of all the demos & rallies, and some of the picket lines. 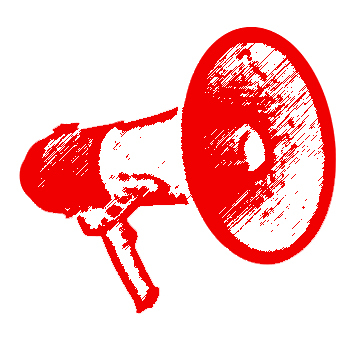 If you can’t see something close to you, go down to your nearest Job Centre or Leisure Centre where there is a high chance there will be a picket early in the morning. 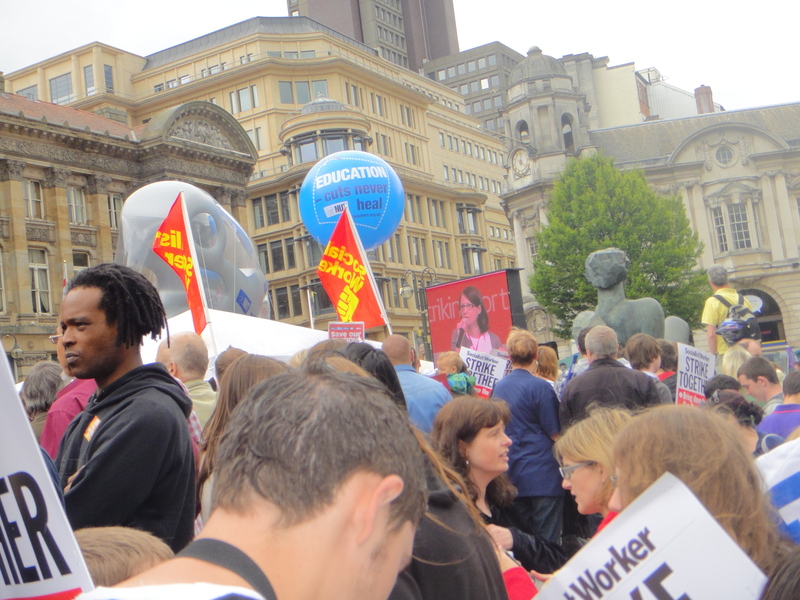 If you work in the city centre, spend your lunchtime at the strike rally in Victoria square, which assembles at 12noon and will march around the city centre from 12:30 before returning to Victoria Square for a rally. 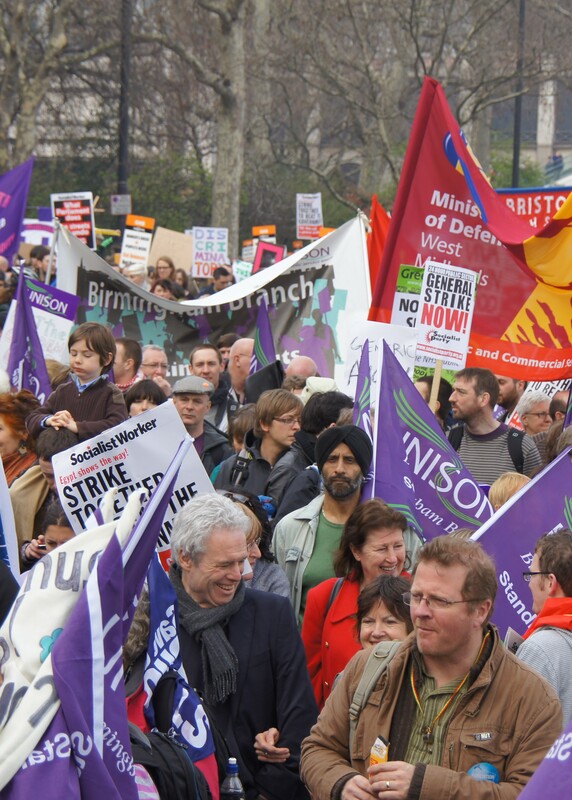 There will be national and local speakers from all the unions involved in the strikes. Today is J30. Today we strike for the alternative. 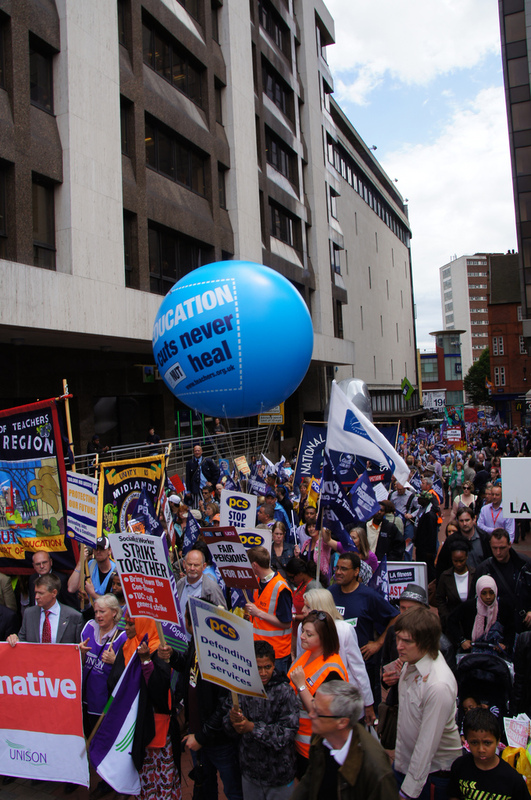 Tommorow sees mass public sector strikes, and Birmingham will see some of the largest strikes, as teachers and civil servants are joined by council workers and connexions to strike for the alternative. 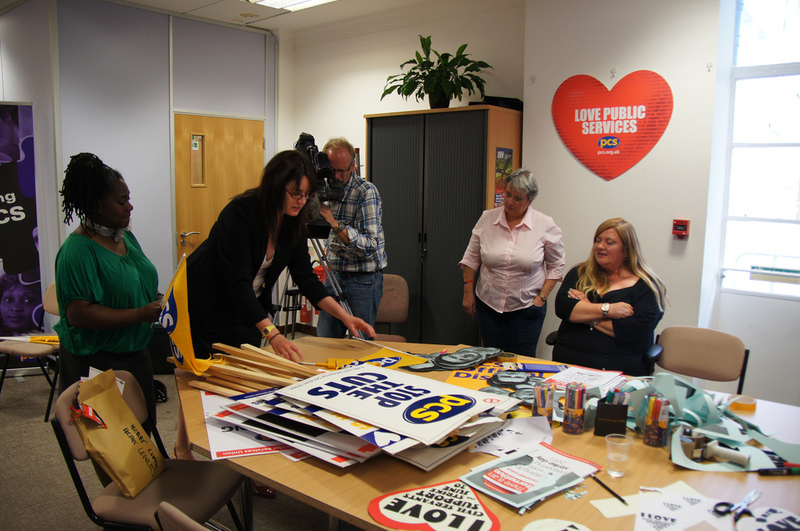 Over the last few days, final preparations have taken place for the hundreds of pickets, demos and rallies that will happen tomorrow. 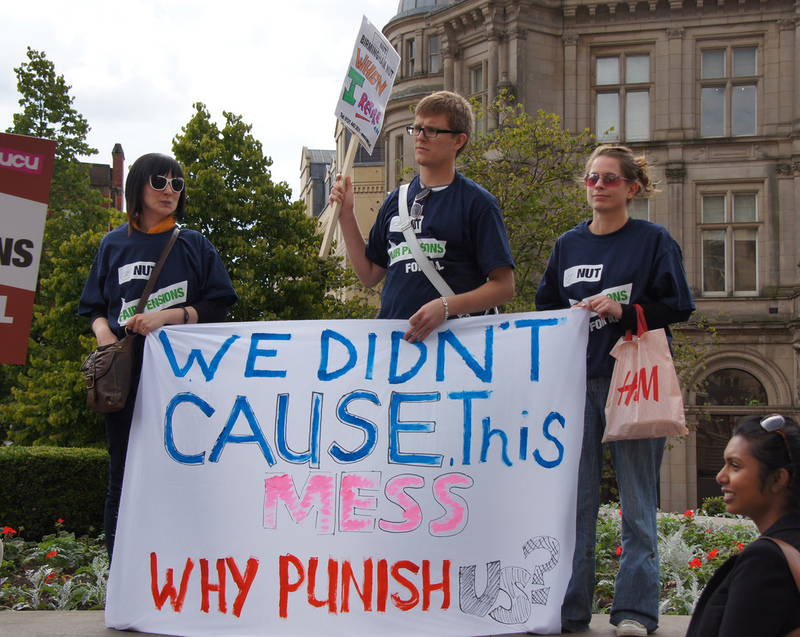 I have been trying to get as much information as possible and map out the actions so you know where you can go – at the moment there are over 70 actions listed around Birmingham, but this is by no means a complete list. Have a look at the map to see what is happening near you, join a picket line in the morning (if there’s none shown near you, I’ve probably just missed it – PCS should be out at all Job Centre’s, and UNISON council workers will probably be picketing all the leisure centres). 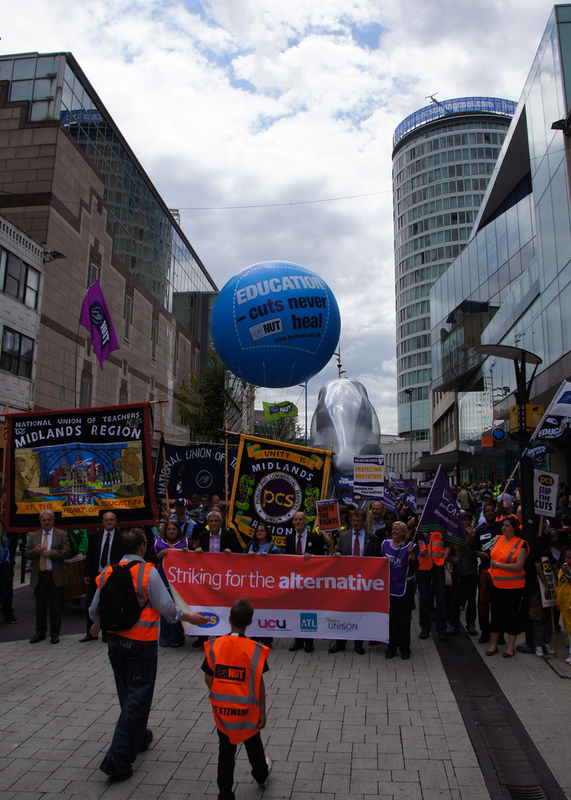 Join one of the UNISON demos at 10am, UCU at Bournville College at 9:15, Connexions on Broad Street at 10:45 or the rallies in Wolverhampton and Stourbridge which will all converge on Victoria Square at 12noon for a huge regional strike rally, with national and local speakers from all the unions and groups involved. 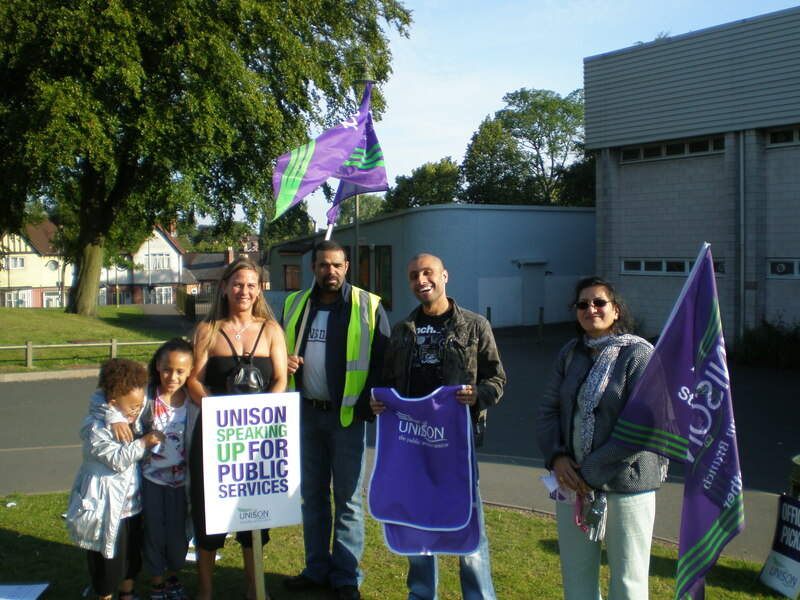 Over the last few days, unions and activists have been working hard to build Thursdays’ events, and to take the argument for the alternative to parents, members of the public and of course the workers themselves. From door-to-door leafletting and street stalls to the Unite The Resistance meeting last night, hard work has been going to make sure that tomorrow is a huge carnival of resistance to the ConDem’s austerity agenda, and the next stage in the struggle against cuts after March 26th’s March for the Alternative. 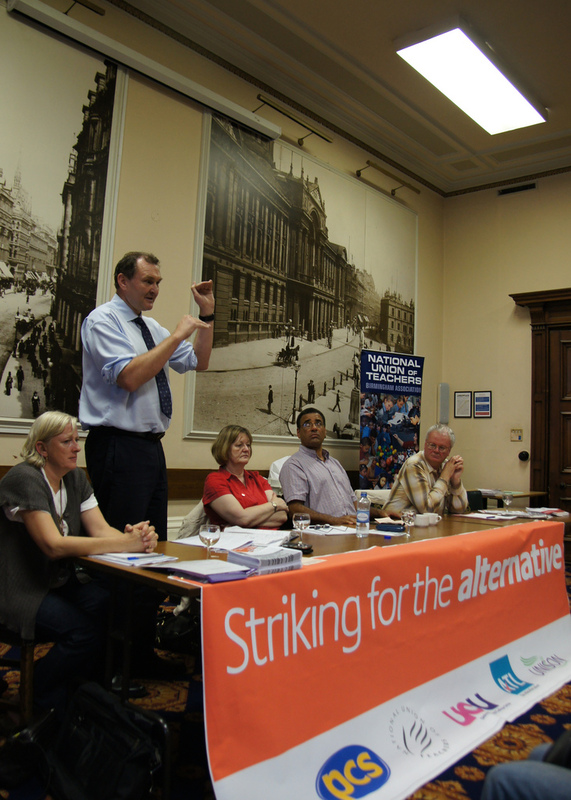 At the Unite The Resistance meeting last night, which close to 100 people attended, we heard from Alan Whittaker – past president of UCU – who spoke about how much teachers will be losing if the pension changes come in. 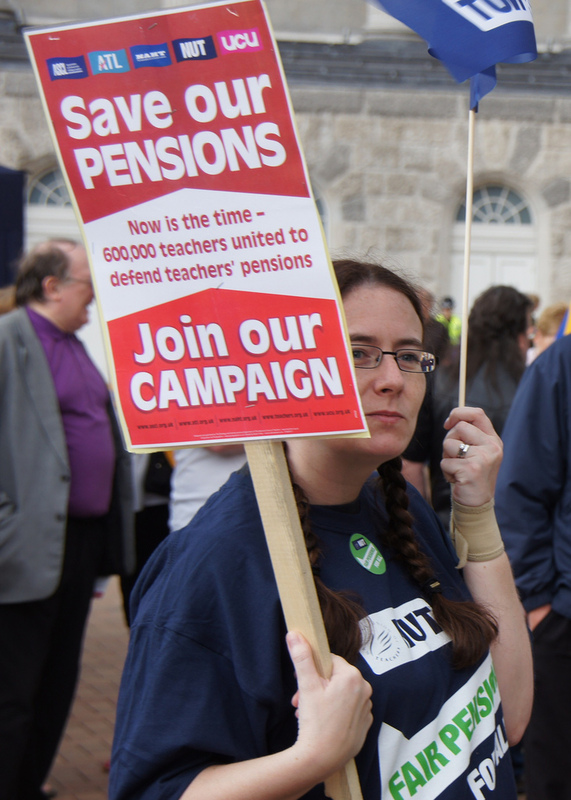 For a teacher aged 25, the total loss over 25 years of retirement will be nearly £300,000. Even for those nearing retirement, the loss will be in the tens of thousands of pounds. 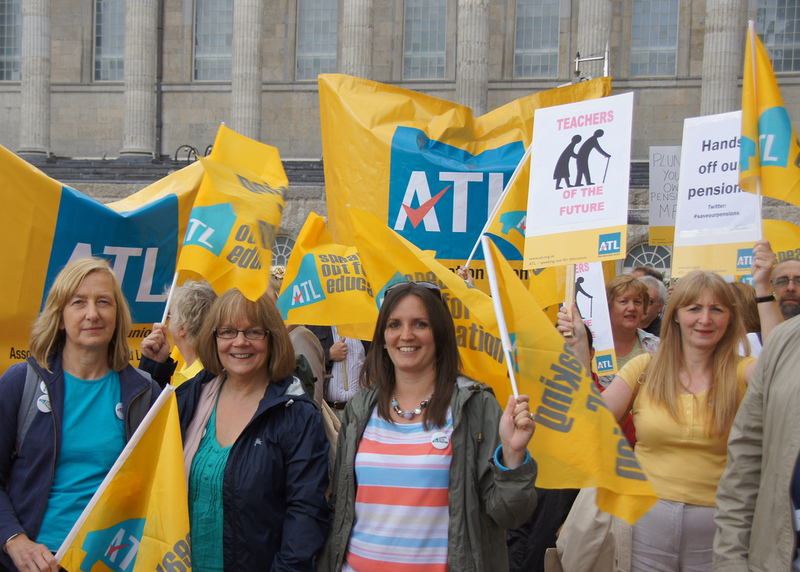 Alan told us how in 2007 the teachers pension scheme was audited and was in good stead, and how there is no reason other than ideology to make the changes to pensions the government are proposing. She told us how both the National Audit Office and the Public Accounts Committee say that civil service pensions are both affordable and sustainable – much like the teachers pensions, and that money saved will not go to make pensions affordable in the future, but will be going to pay off the deficit that was not caused by civil servants. 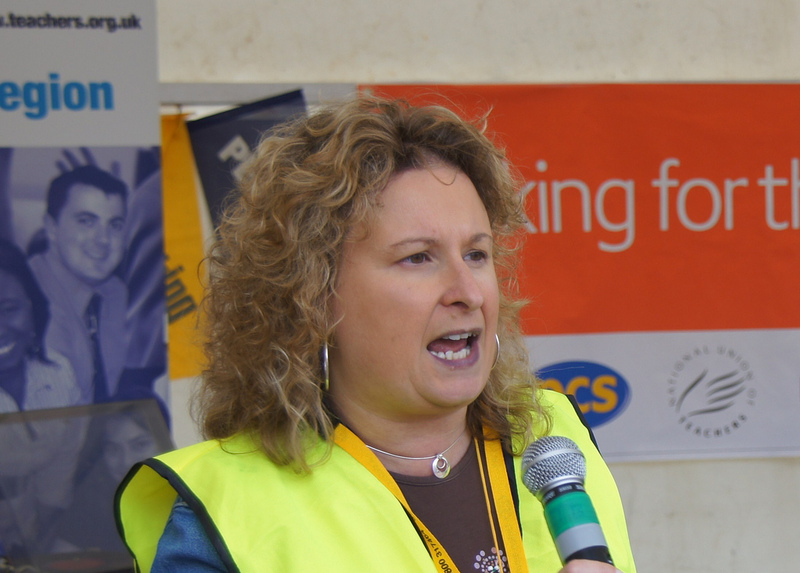 Sue then outlined some of the alternatives that are supported by PCS and the TUC – closing the tax gap (£120bn of tax avoidance, evasion and uncollected tax each year – enough to cover the whole of the deficit) & investment in jobs and growth (in particular green jobs in the manufacturing sector). 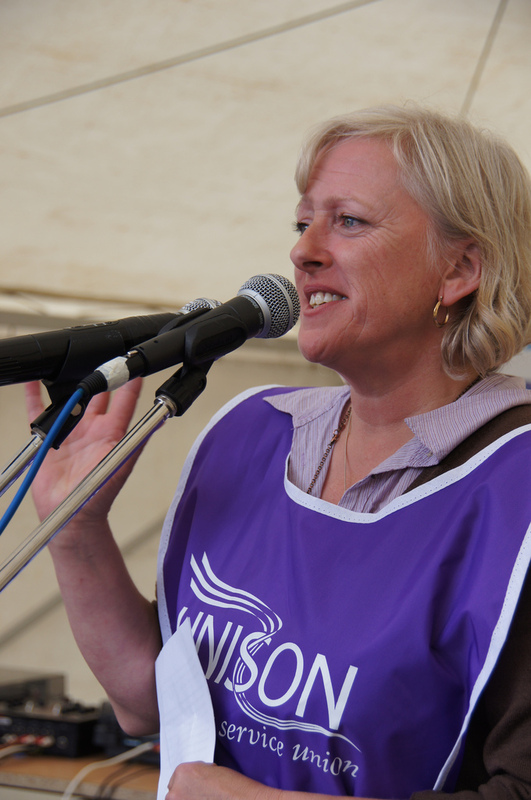 Caroline Johnson from Birmingham City Council UNISON talked of the devastating changes the council are trying to force onto council workers. 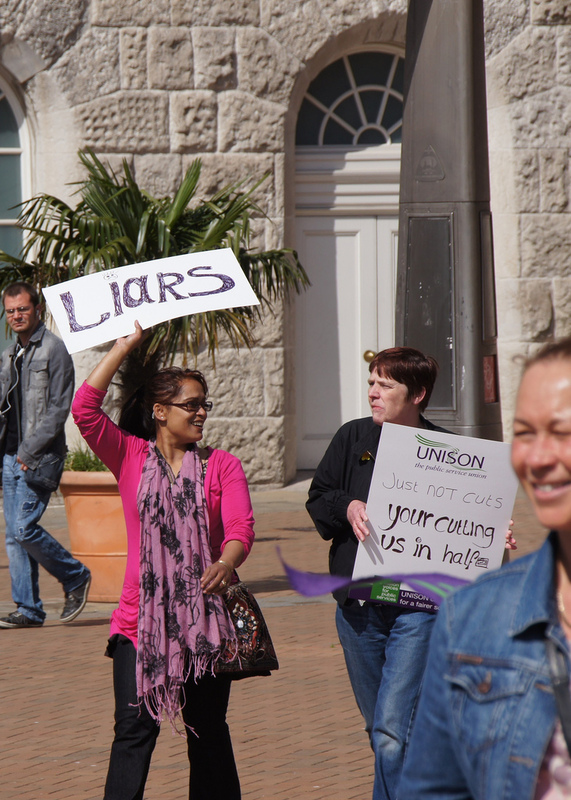 She told us how people are facing huge pay cuts and also savage changes to conditions, which mean the council will be able to tell them to work any job on their pay grade, at any location in the city, at any times (including evening, weekend and unsociable hours). 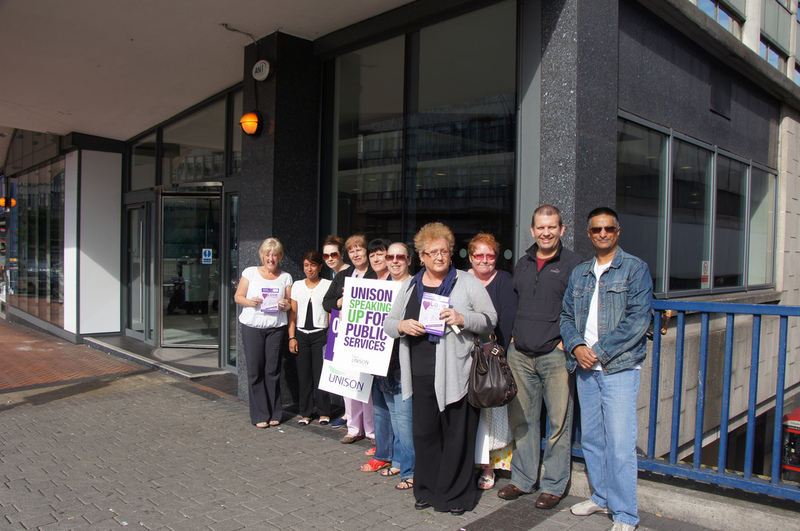 Sheila, a care assistant currently earning £18,404 will lose £4,741. 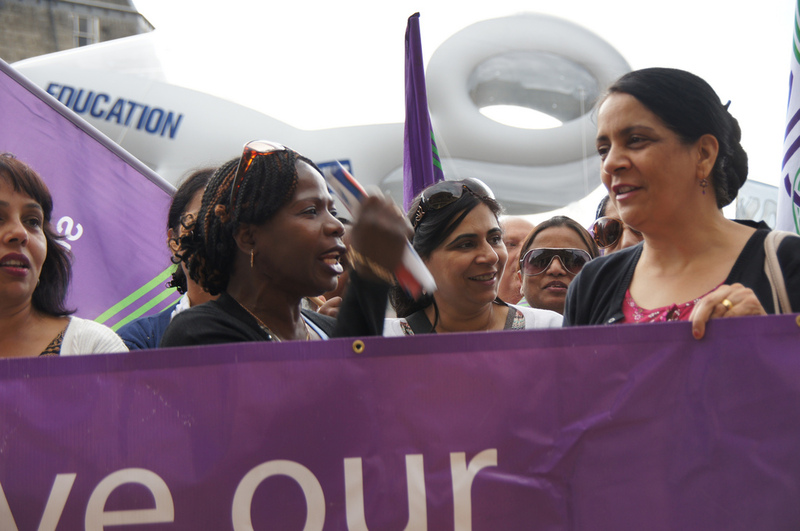 Aleena, a part-time cleaner earning just £3,087 will lose a whopping £847. 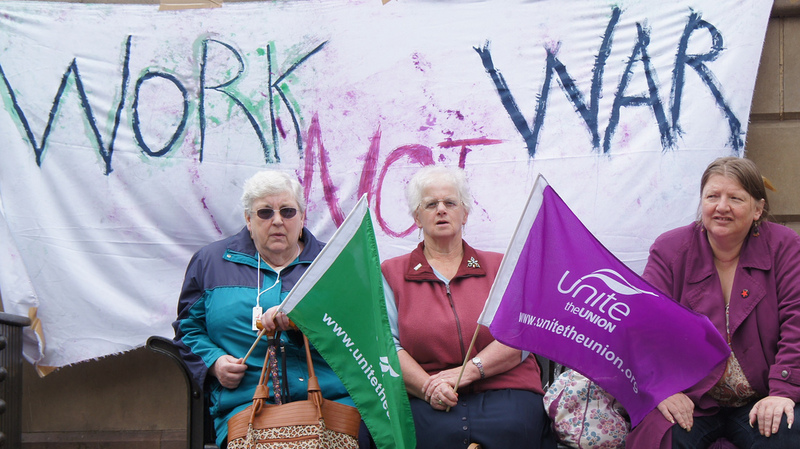 Donna, a home care assitant on £14,829 will see her pay cut by £2,210 and Jeanette, who is part-time, earning £10,168 will lost £4,453. Meanwhile, those who are above a grade 4 will not see their pay cut at all – in fact the only thing they are going to lose is their car parking space. 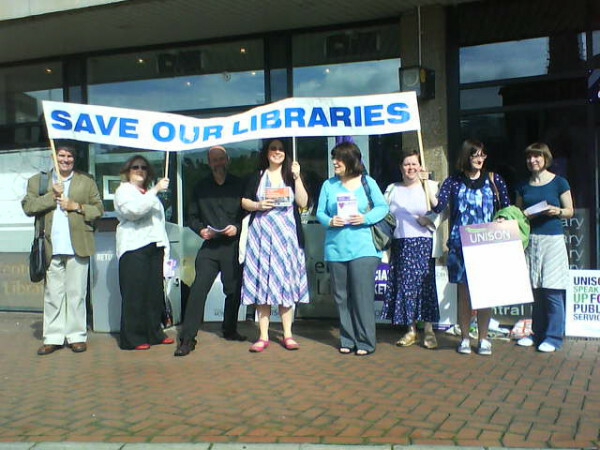 These pay cuts will only save £10m from the council budget so it’s not about saving money – the council spent £60million last year on private sector consultants – so called “experts” who come in to advise on “savings” (otherwise known as advising the council on how to give more money to private sector companies like Capita). 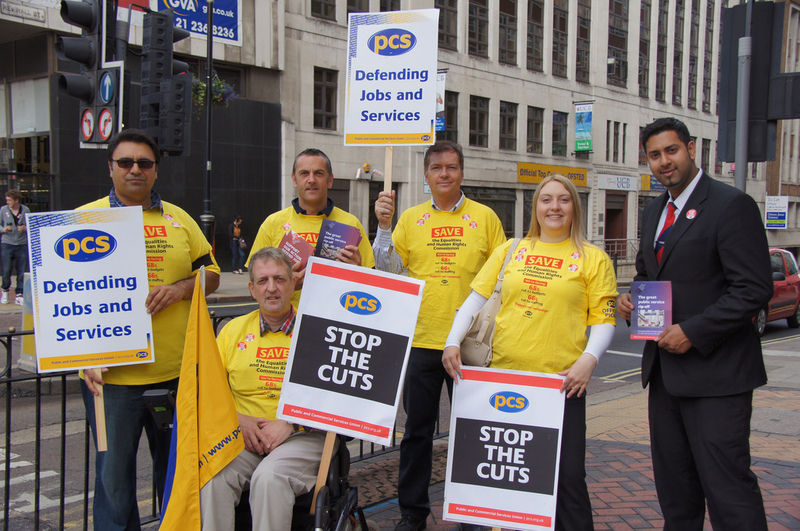 These pay cuts and condition changes are about setting the council’s services up for privatisation. 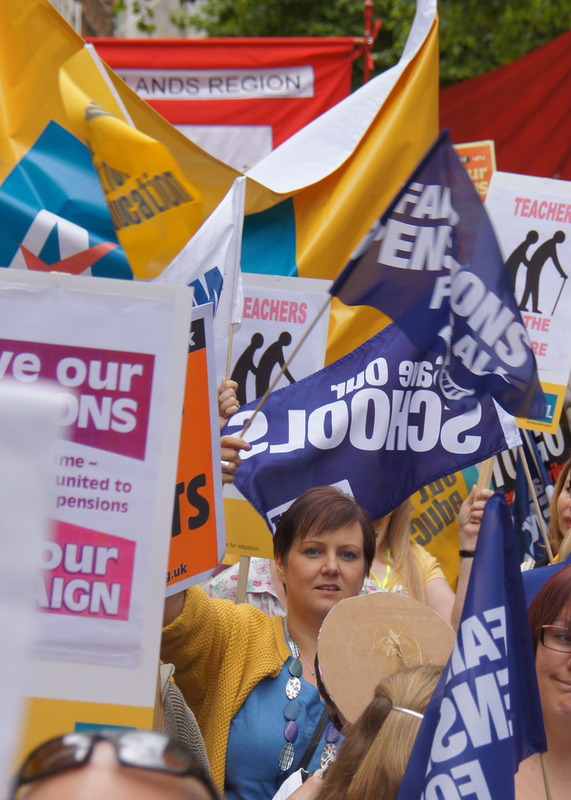 She said she was very pleased to be striking alongside other unions on Thursday, that their members are concerned about going it alone, but they know that over the summer they will have to do that. 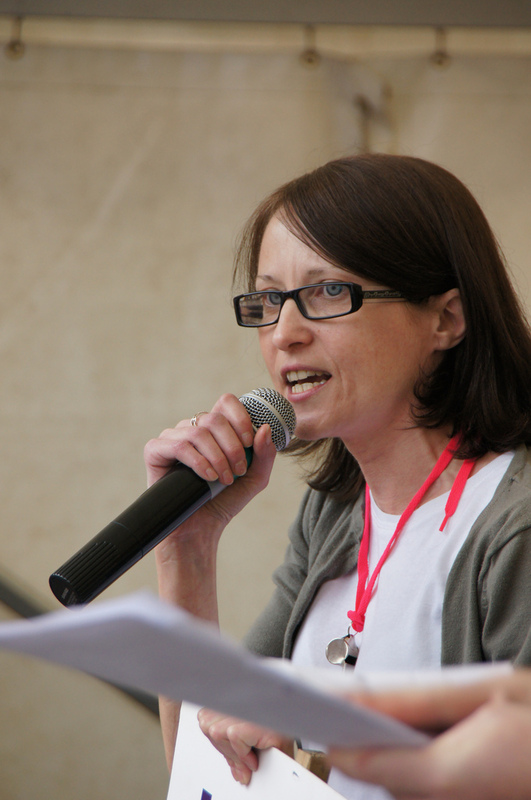 She does not think the council will back down easily and anticipates further strikes over the summer and autumn to prevent the imposition of this disgusting contract in November. 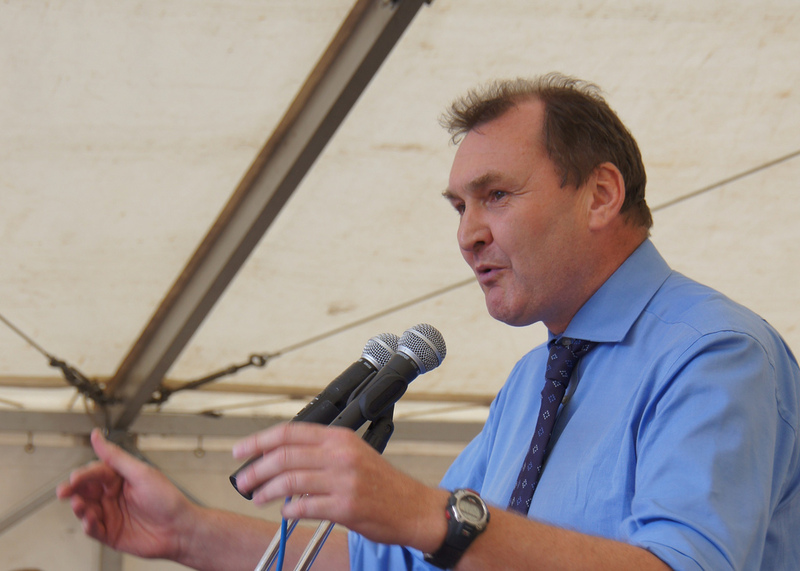 Like other speakers, Kevin talked about tax avoidance, calling Philip Green (who in 2005 paid his wife £1.2billion, avoiding £285million in tax) “astonishingly avaricious”. 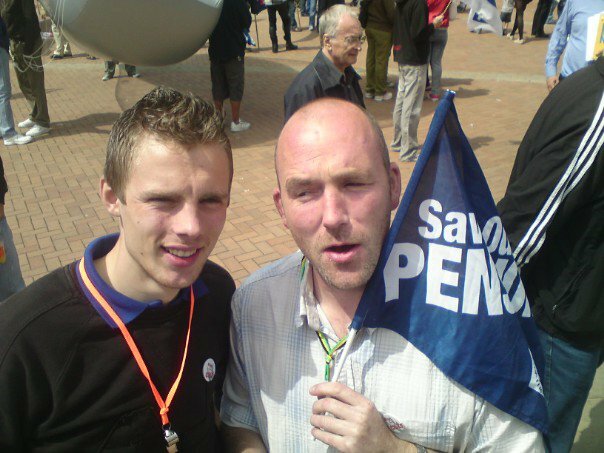 He said that the pensions fight is a dispute that teachers can win, and that if we do score a victory it will change the dynamic of the anti-cuts movement. 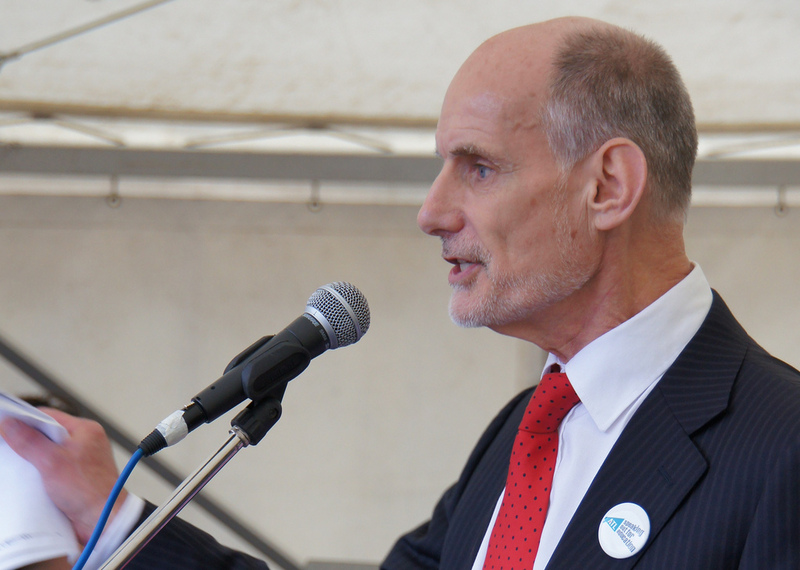 He said that the government has completely lost the confidence of the teaching proffesion, pointing out that ATL have never balloted for strike action in 125 years, but they got an 83% vote for strike, and the fact that a heads union will ballot for strike shows how badly the government have misjudged the mood of the teachers. 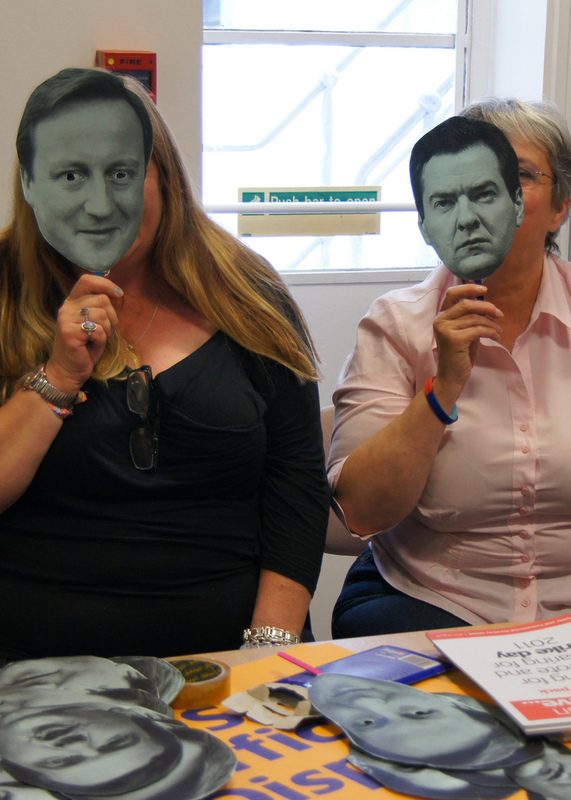 He also said that this could not just be about teachers for them, but about all public sector pensions. 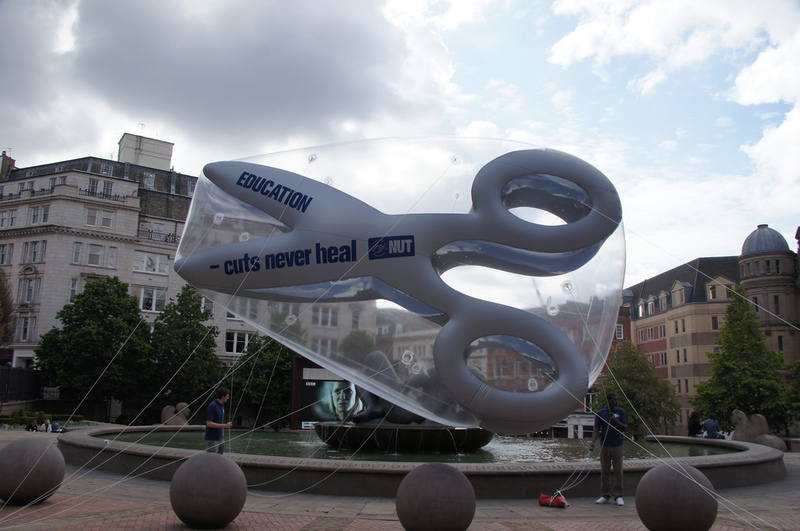 Saying that “the cuts are completely without justification”, Kevin explained how in negotiations, the government would not justify their position. When asked why the pensions are changing from RPI to CPI, the government simply said “we think it is appropriate” without explaining why it is appropriate, or why they will use RPI for student loans. 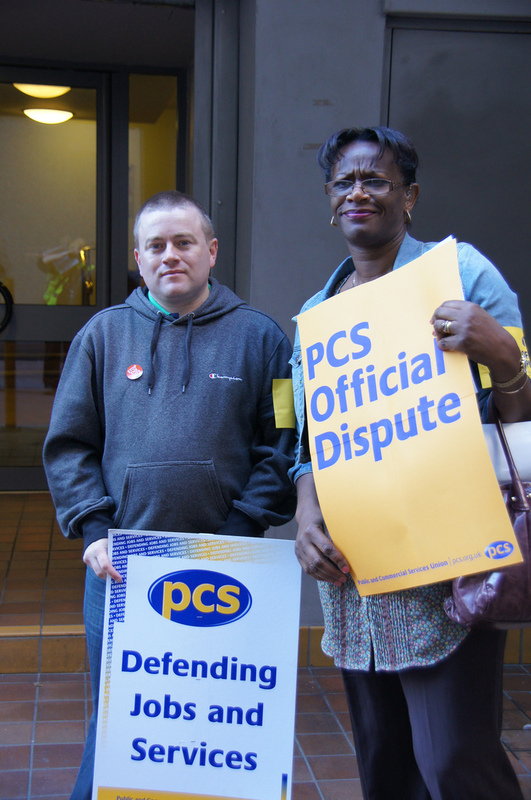 He said the government produce no arguments – that this is simply an attack on public sector workers. 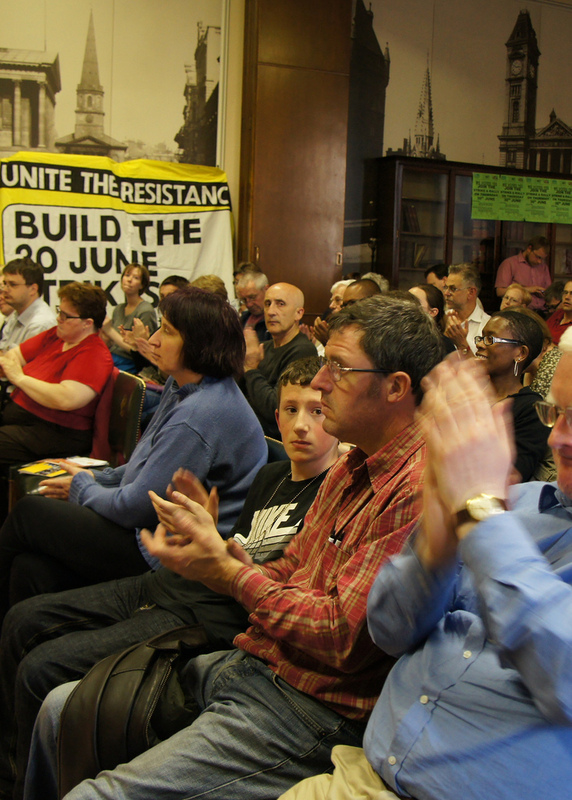 There was then time for discussion from the floor, and people were keen to link up the strikes to the wider fights against cuts, austerity and neo-liberalism. 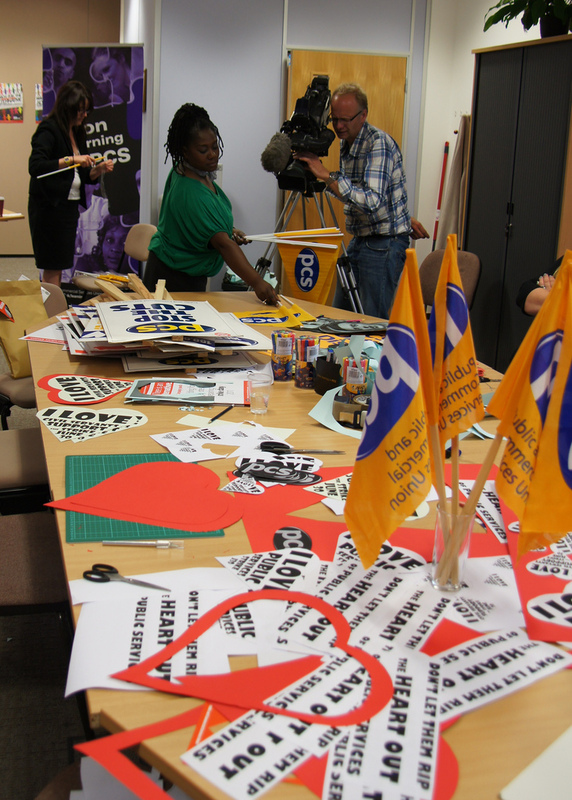 Various things were mentioned, including the decision by Connexions to join the strike on Thursday, and the demonstrations that will take place for the Liberal Democrat conference in Birmingham (18th Sept) and the Tory conference in Manchester (2nd Oct). 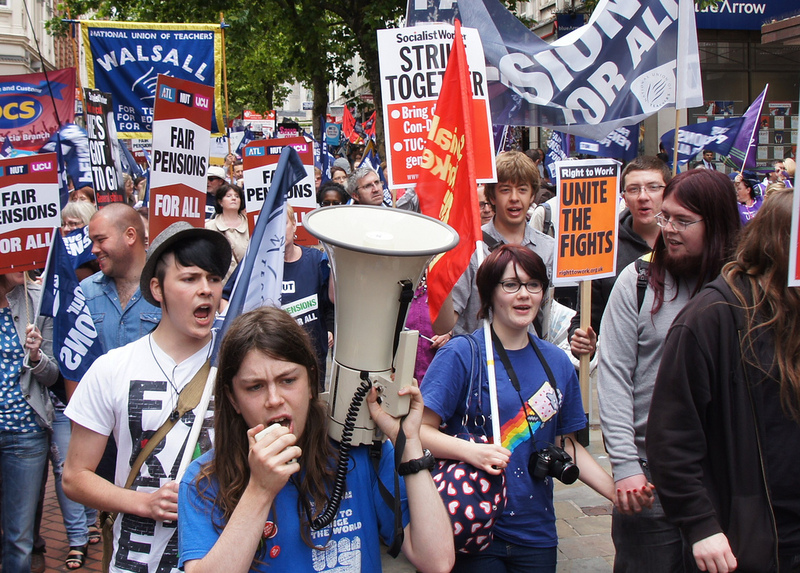 This Thursday, the fight back continues – what started with the Tory conference march in Birmingham in October last year, and was given a huge boost by the student demonstrations in November and December, and groups like UK Uncut, through the March for the Alternative, local council cut and mayday demonstrations and will not just continue but grow and spread tomorrow. J30 will be a date to remember. 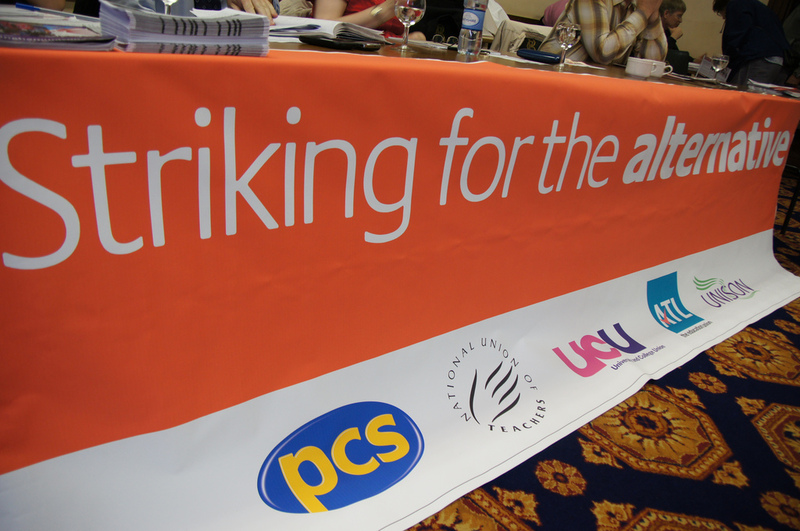 On Tuesday, there will be a public meeting, called by representatives of UCU, NUT and PCS whose unions will be on strike on Thursday, along with ATL and UNISON. 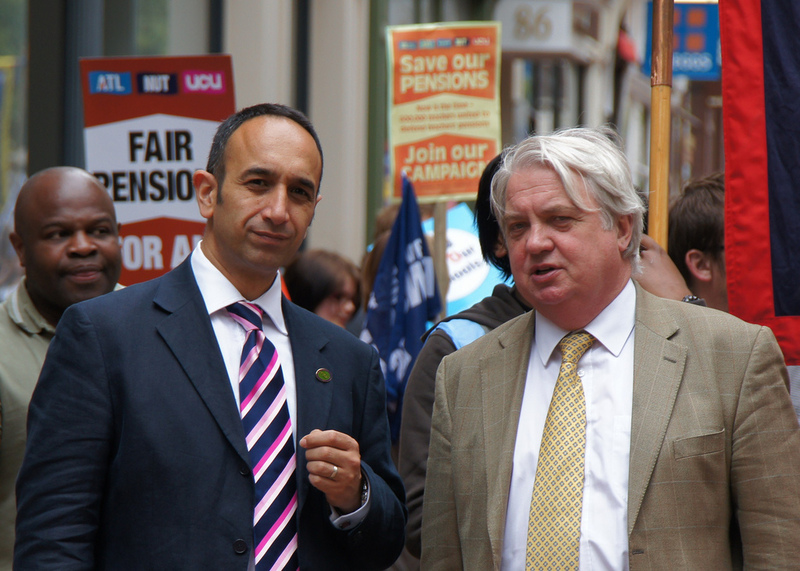 Alan Whittaker – UCU Past President. 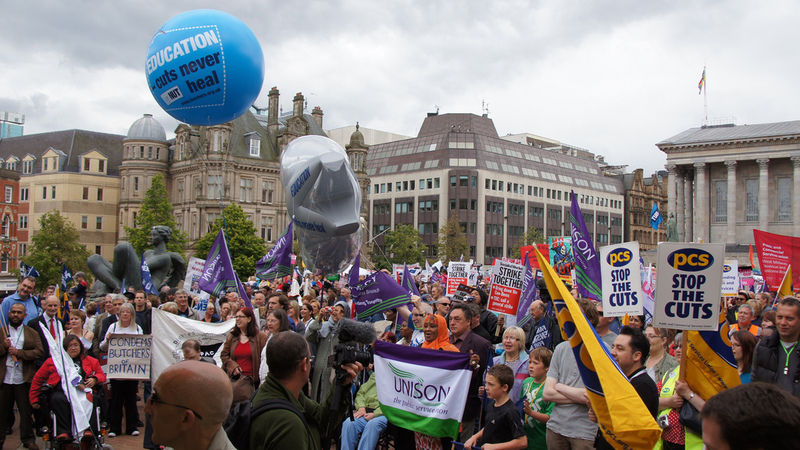 The meeting runs from 7:30pm at the council house, and everyone who wants to help to make June 30th the biggest day so far in the struggle against cuts and the austerity agenda, and to help fight for public services and the alternative, is welcome to attend. 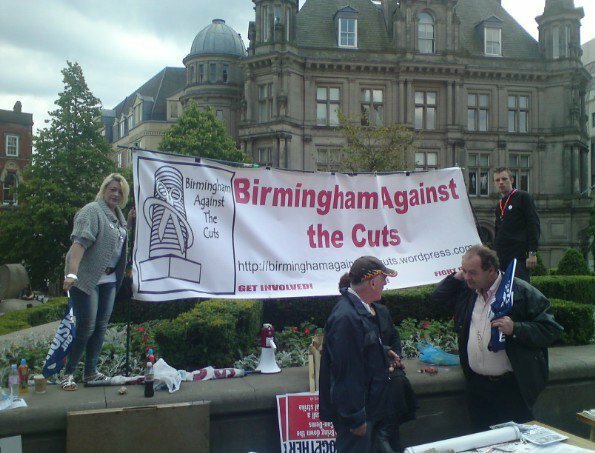 “Birmingham City Council’s attacks on jobs, services, pay and conditions show that the City Council has little respect for its employees, its tenants or its residents. 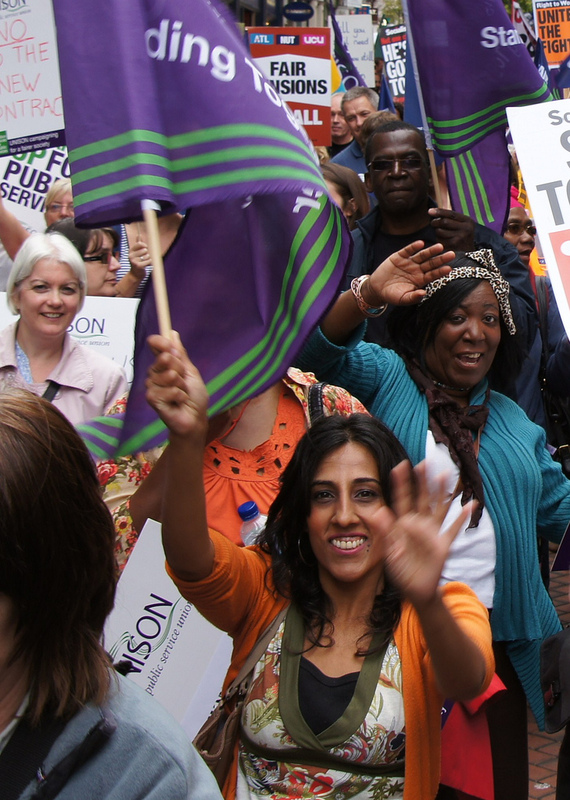 UNISON must lead the way in saying ‘enough is enough’. 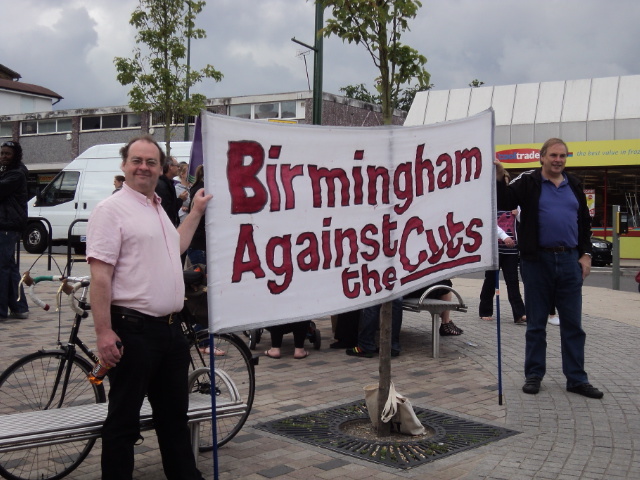 Without you, the council could not ensure the education, safety or wellbeing of the people of Birmingham and you deserve better. 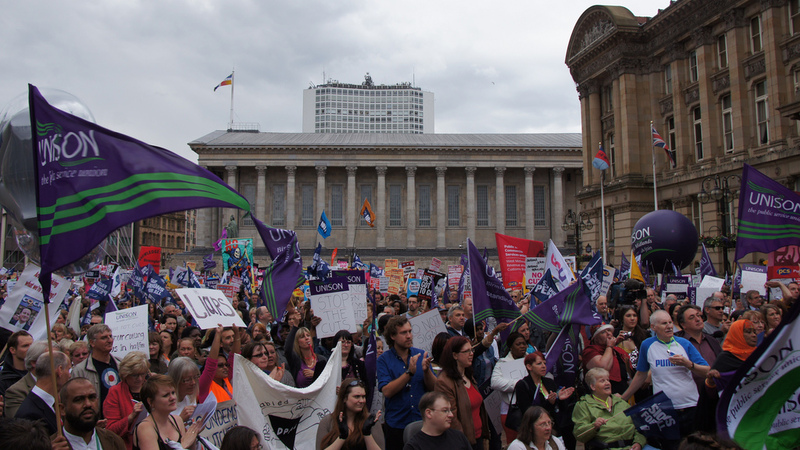 We know that what Birmingham does today, others will do tomorrow. 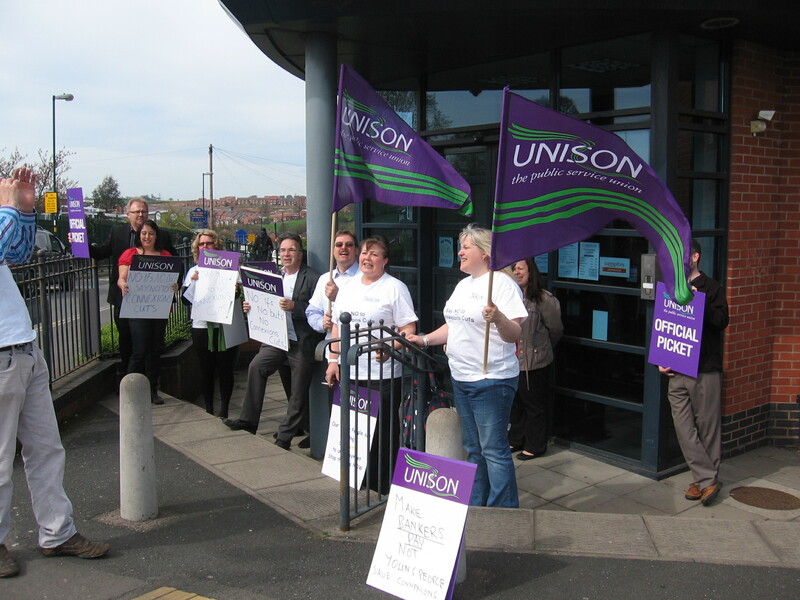 Please give your full support to the industrial action. 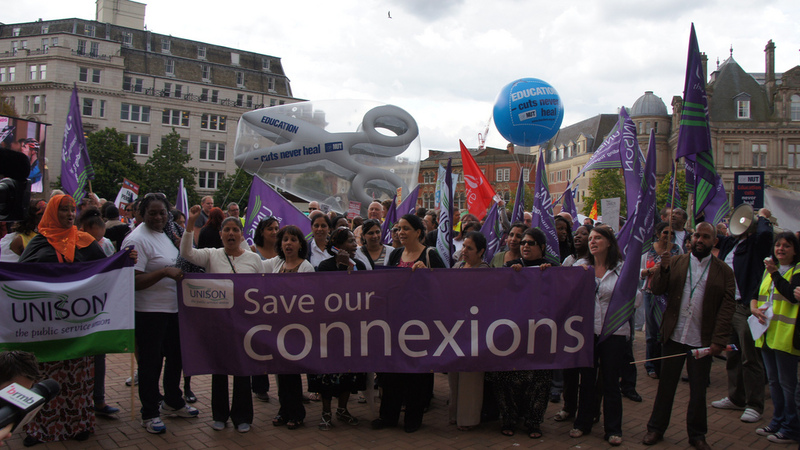 We need to show the council that it cannot deliver without its workforce and that you deserve better treatment. 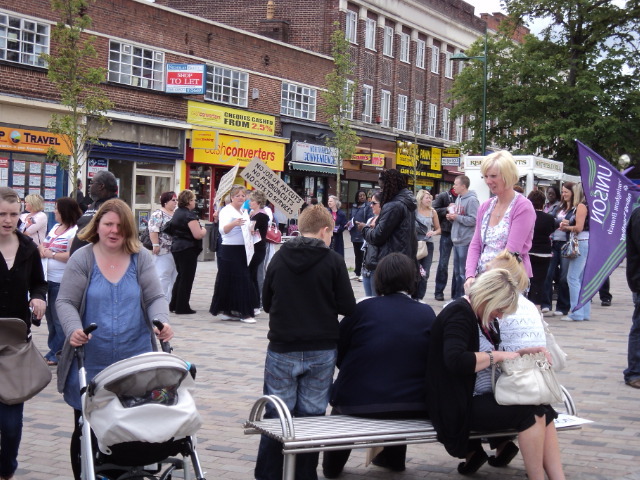 We would like to re-iterate Heather’s words, that without its workers, the council could not deliver the services it provides to the people of this city. 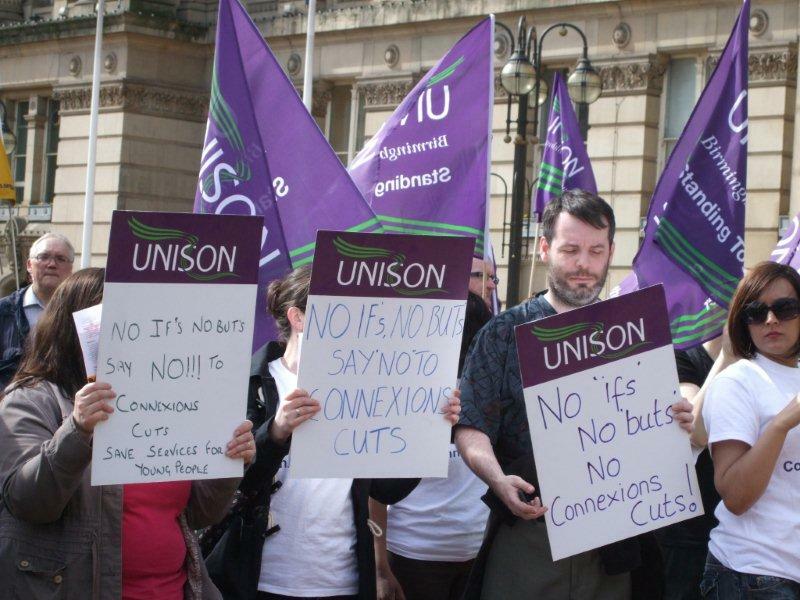 This is why everyone in Birmingham should support the council workers going on strike. 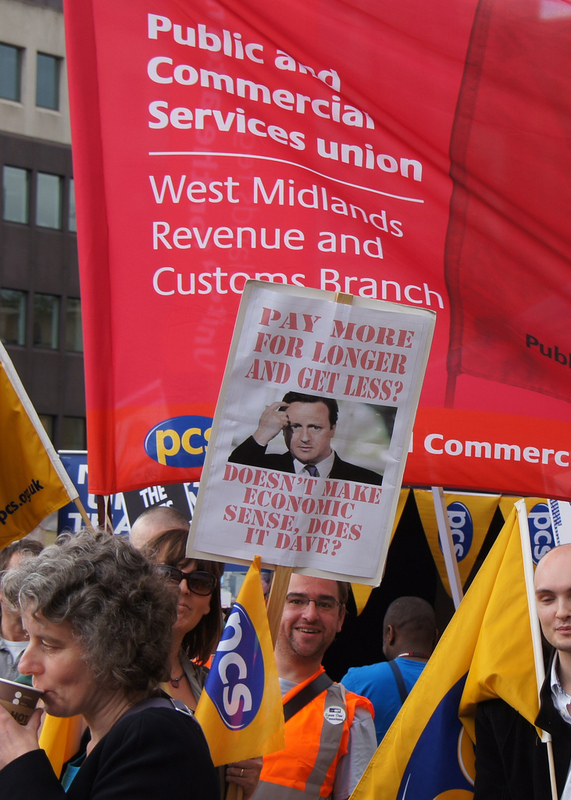 The new contract slashes pay and changes conditions. 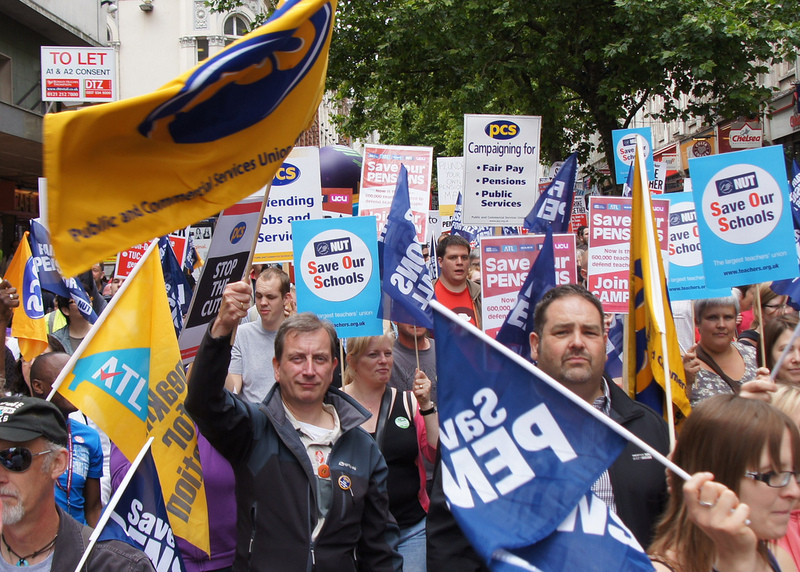 By removing shift allowances (extra pay for working unsociable hours, weekends, evenings and night shifts) many workers are finding their pay will drop by thousands of pounds. A Home Care Assistant for instance, may be on around £14,000 at the moment but will see their pay drop by as much as £2,200. This might be a person who goes to people’s homes to ensure their well being, and helps to look after people who need it – whether this is elderly people, someone with a disability or someone recovering from a serious injury/accident. 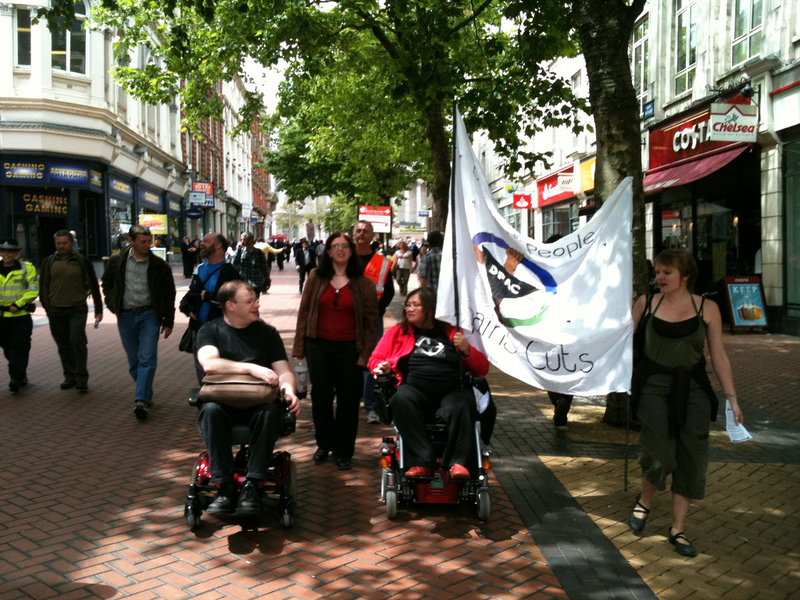 They often work evenings and weekends, since obviously people need help at all times, and their work enables the people they help to remain living in their own home and achieve a degree of independence that would not be possible if they were living in a home or sheltered accommodation. 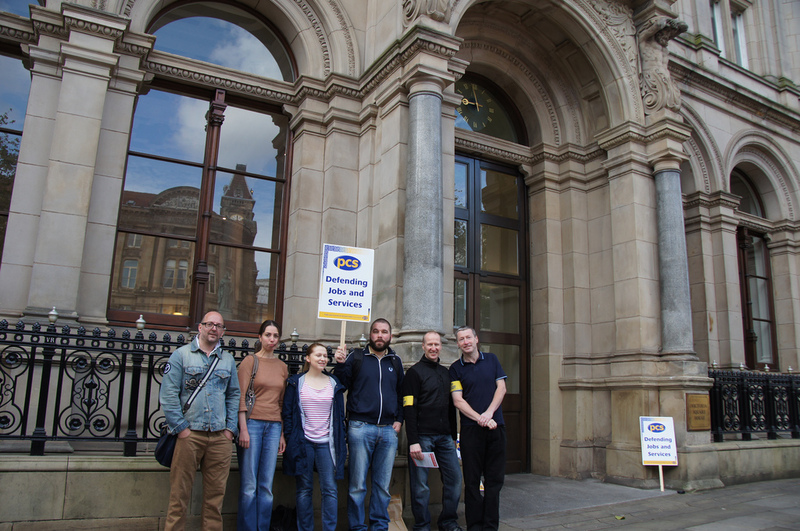 The changes to conditions are equally harsh – the new contract will mean that the council can force any worker to change to a different job (on the same pay scale), in any location around the city, working any hours. So someone who works monday to friday, 9-5, within walking distance from their family home, could be forced to change to a totally different job, working evenings and weekends on the other side of the city. Their choice will be to take the job or quit. For many people this means they could be doing something which is utterly unlike the job they originally signed up for. It may well be unsuitable for them – they may have a family or other commitments that mean that they are not able to work evenings or weekends. 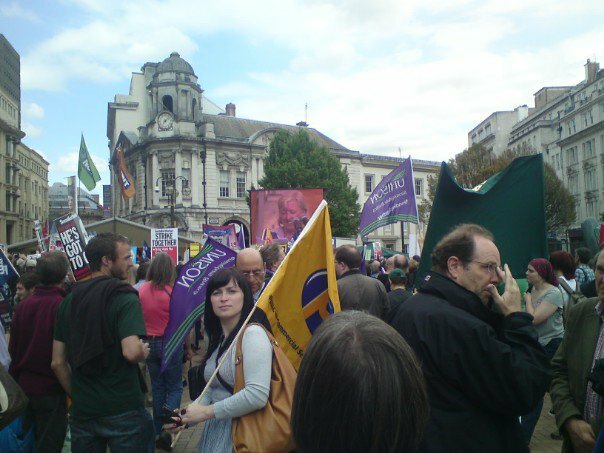 So we need to support the council workers’ strike, as a defense of our services and part of the ongoing struggle against cuts and for the alternative. 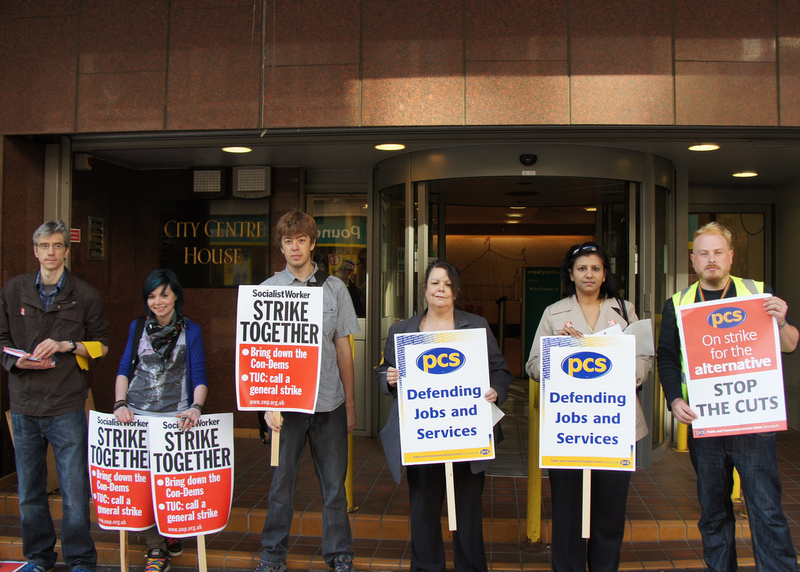 Yesterday I posted something you can do each day in the run up to Thursday’s strike day. 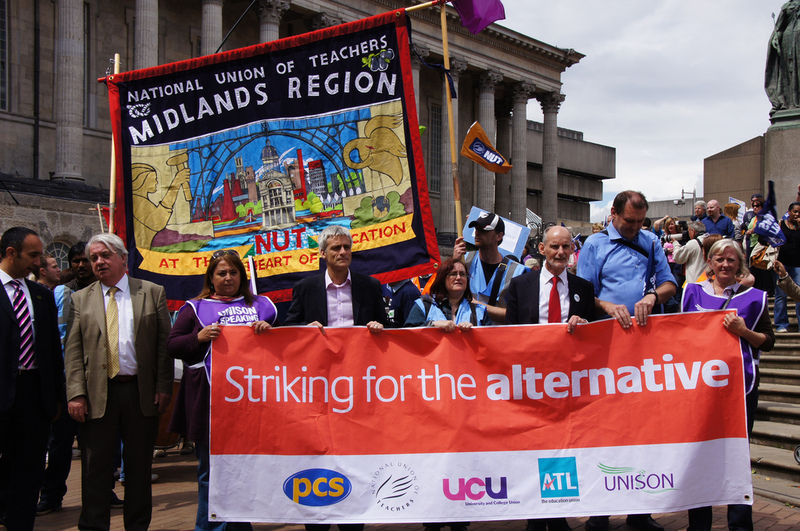 The biggest strikes in recent history are just 7 days away, and Birmingham will be amongst the biggest because our council workers are striking alongside teachers, lecturers and civil servants, defending their pay & pensions and our services. 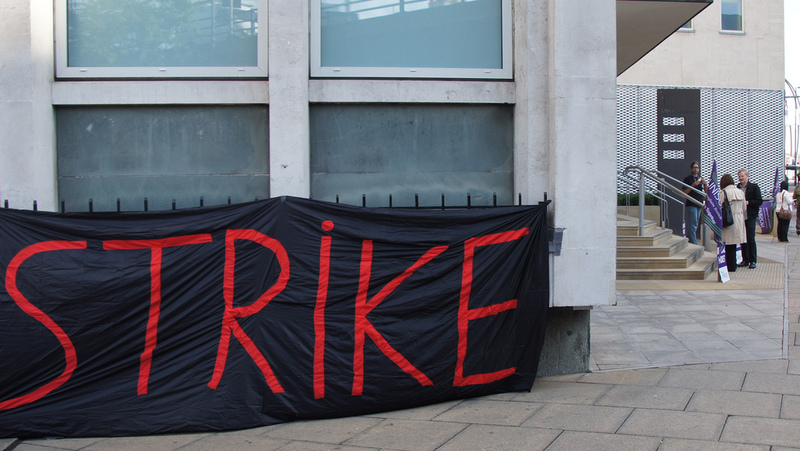 (a) if you work in a striking workplace, talk to other people at your workplace, especially those who are not unionised, about the strike. 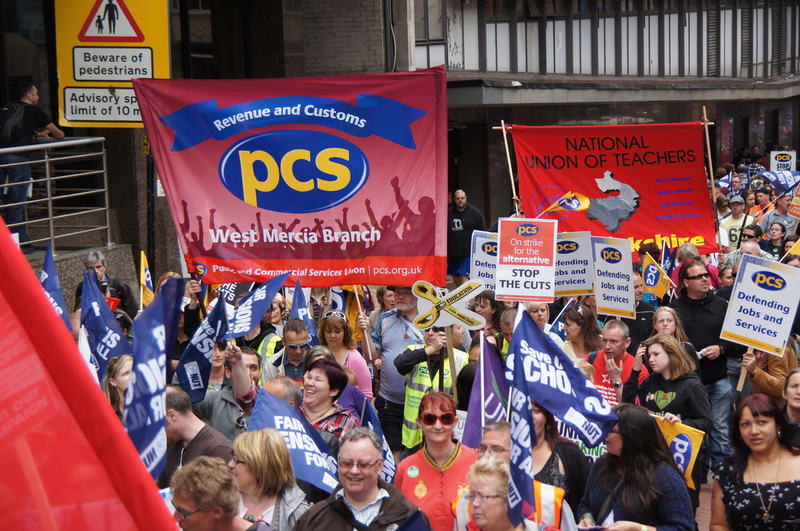 If you can, try to get non-unionised people to join the union – if they join before the day of strikes, then they are legally entitled to strike. 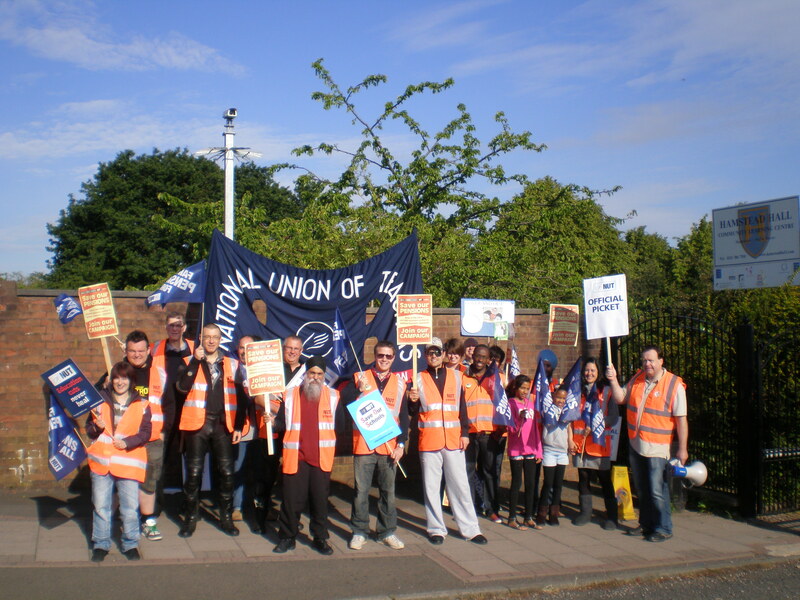 If you are in a non-striking workplace then talk to other people about the strike and why they should support it. 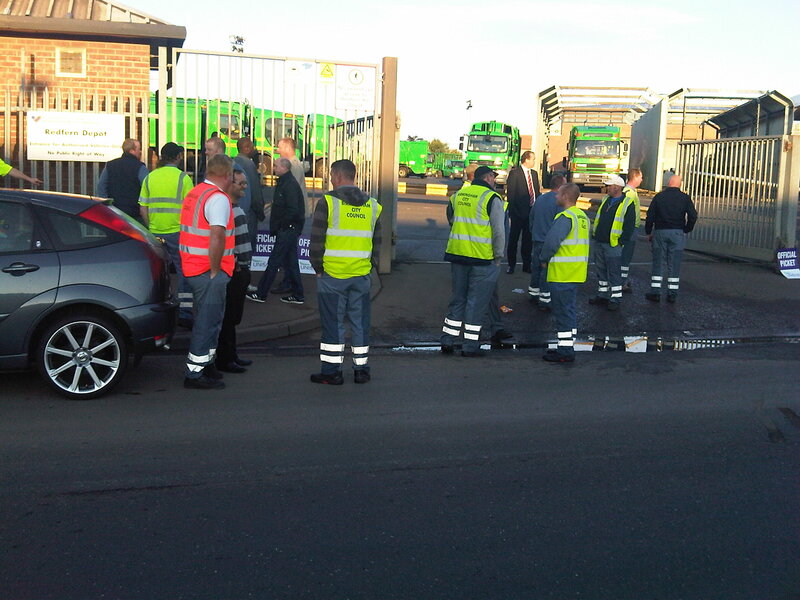 If possible, talk about organising a group of you to go to a nearby picket in the morning before work to say hello (I’m informed that tea and biscuits are always very welcome). (b) if you don’t currently work, and know other people who don’t work, why not see if you can find a group to come with to the strike rally. 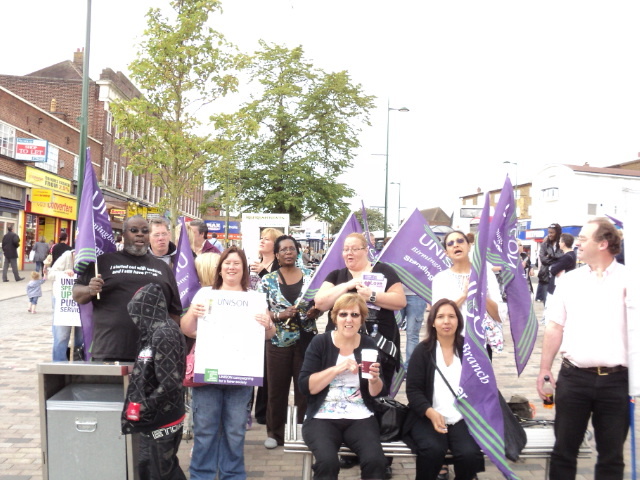 We all need to be out to show the strikers our support, as these strikes defend public services we all benefit from. 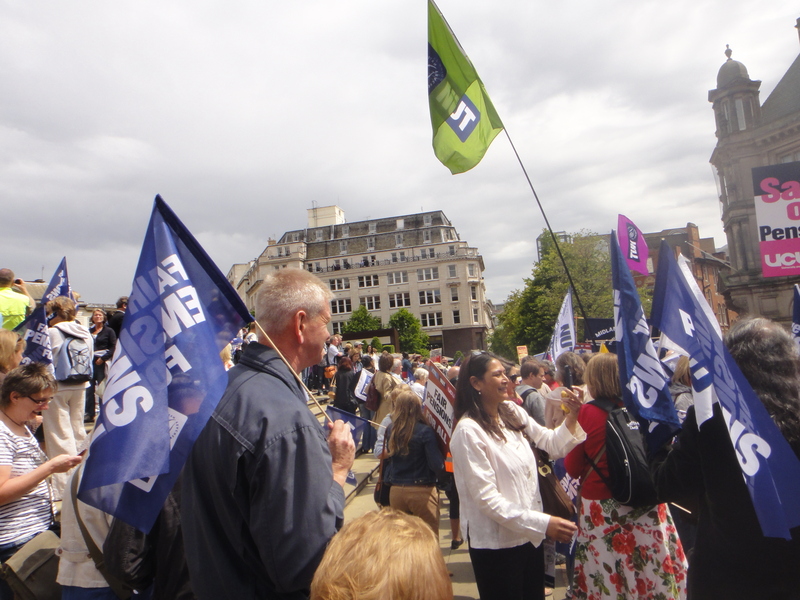 By showing that this is not just the public sector workers we can also show a wider resistance to cuts and this government in general. 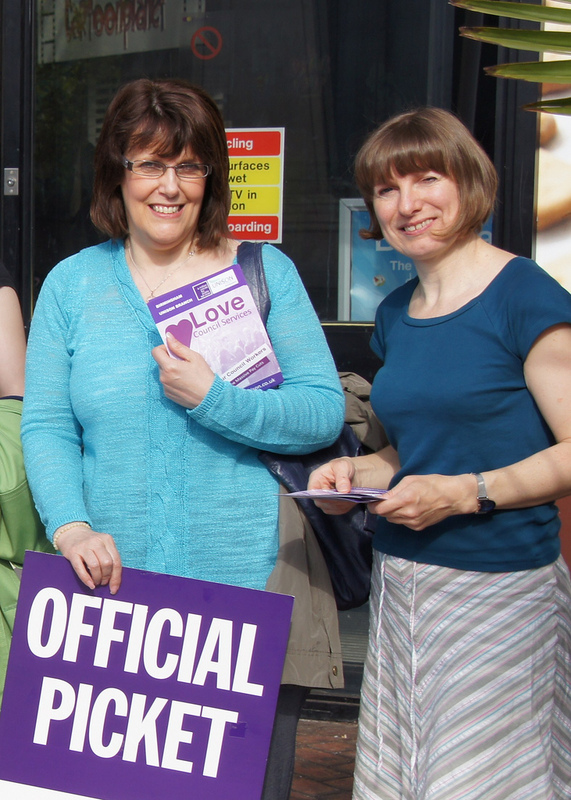 Come and help us leaflet, 12noon-2pm, Birmingham City Centre, near Waterstones High Street. 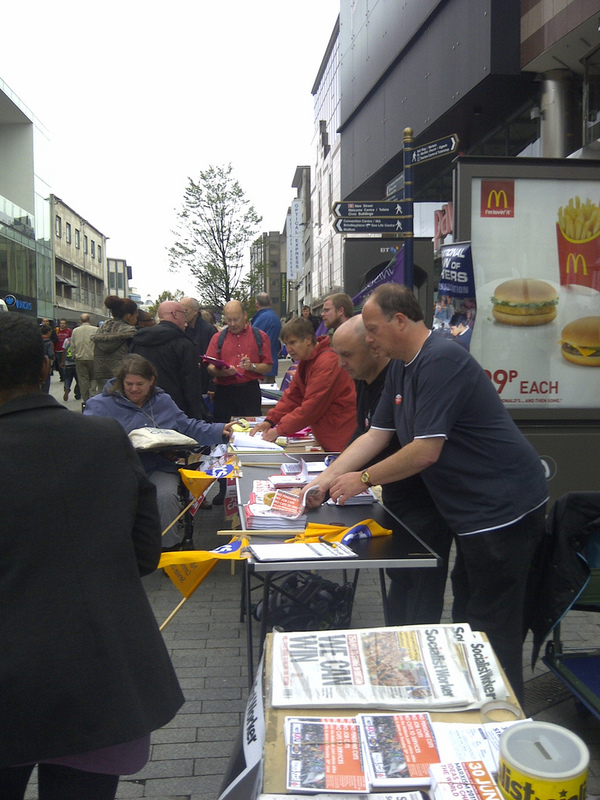 As well as Birmingham Against the Cuts, the striking unions will be running stalls and leafletting. Everyone needs a day off politics 😉 Read the papers, spend some time with your family and/or friends. 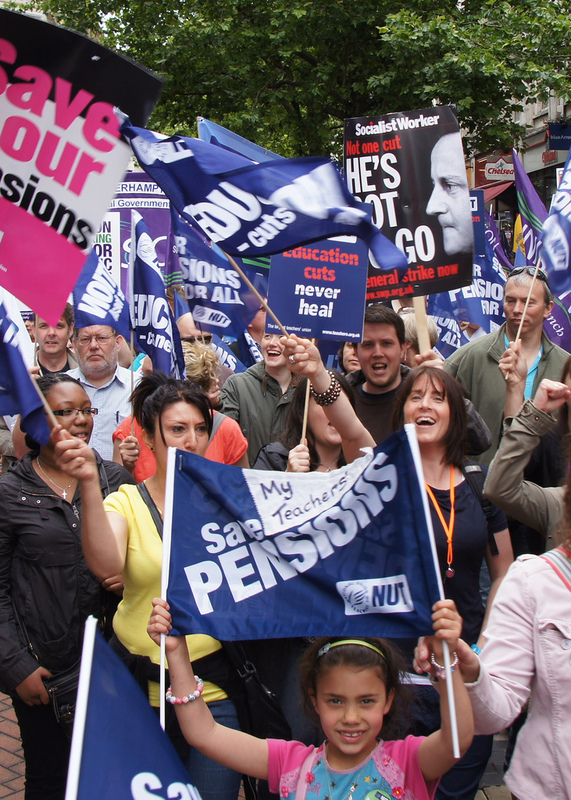 If you’re really feeling keen then I’d suggest reading up on the strike, and find answers to the arguments stated and questions posed by the right wing press about pensions and striking workers. 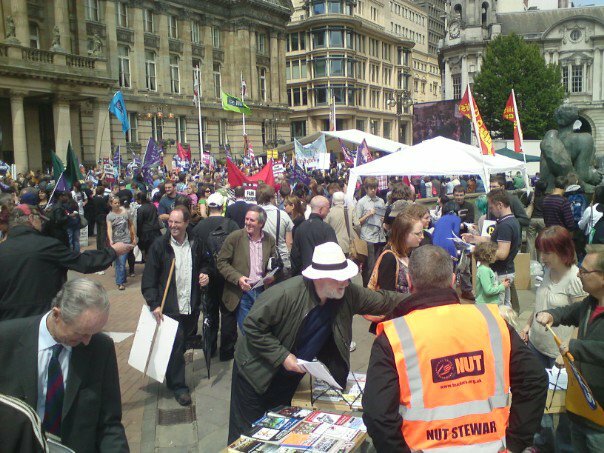 If you work, drop some leaflets that you picked up at the stall in your workplace. 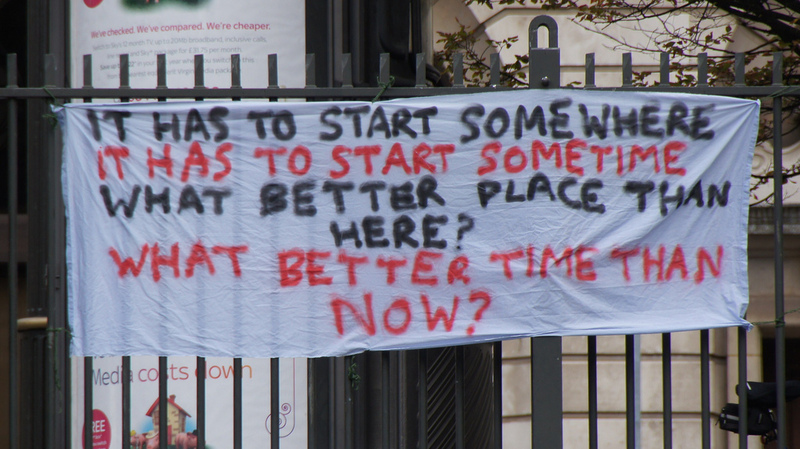 If you don’t currently work, why not leaflet your street or somewhere else that you think would be better. Perhaps a school and talk to the parents about why they should support their teachers going on strike. 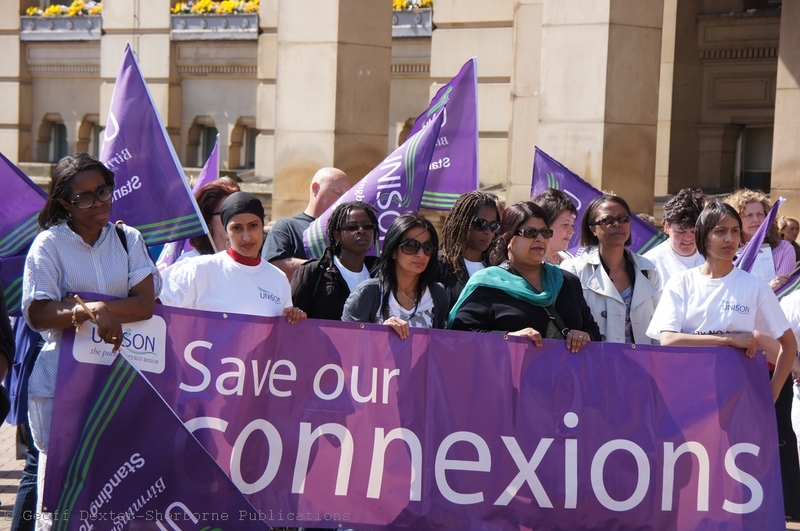 Public Meeting at the council house, 7pm. 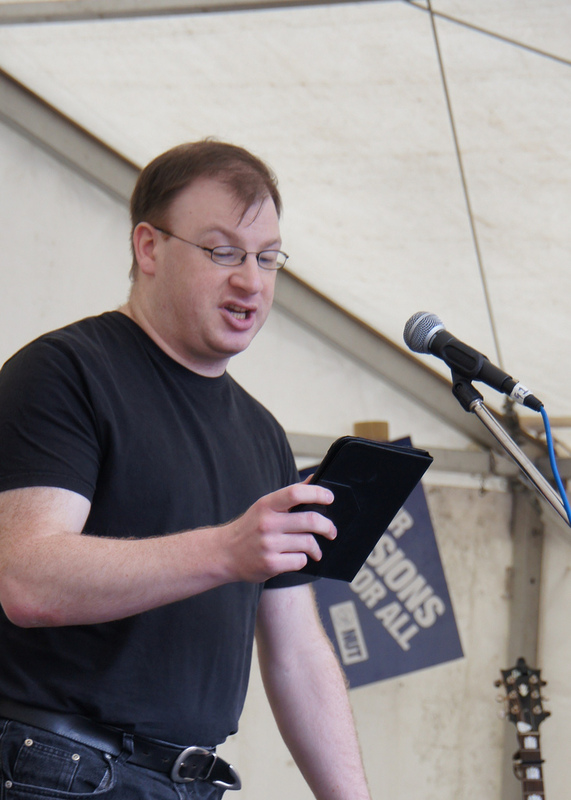 Speakers include Kevin Courtney, deputy general secretary of the NUT. Come along to help to build the final push. 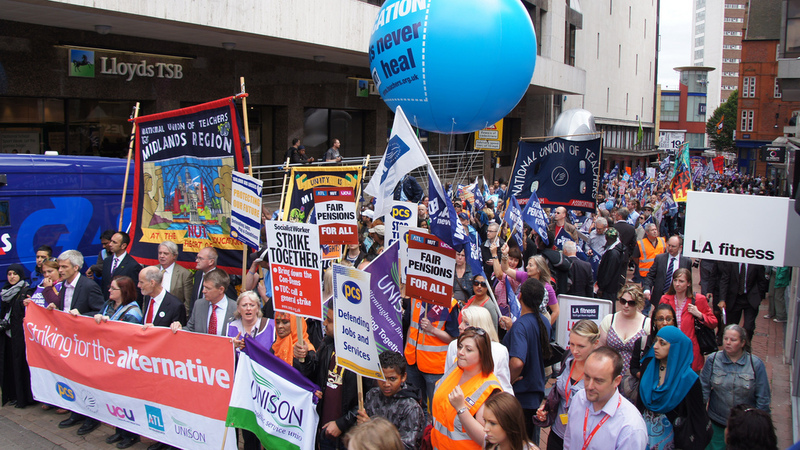 If you’re striking – is everyone at work in the union? Last chance for anyone to join the union, and make sure people know about the strike rally and any picket arrangements you have. Encourage everyone to come to the strike rally. 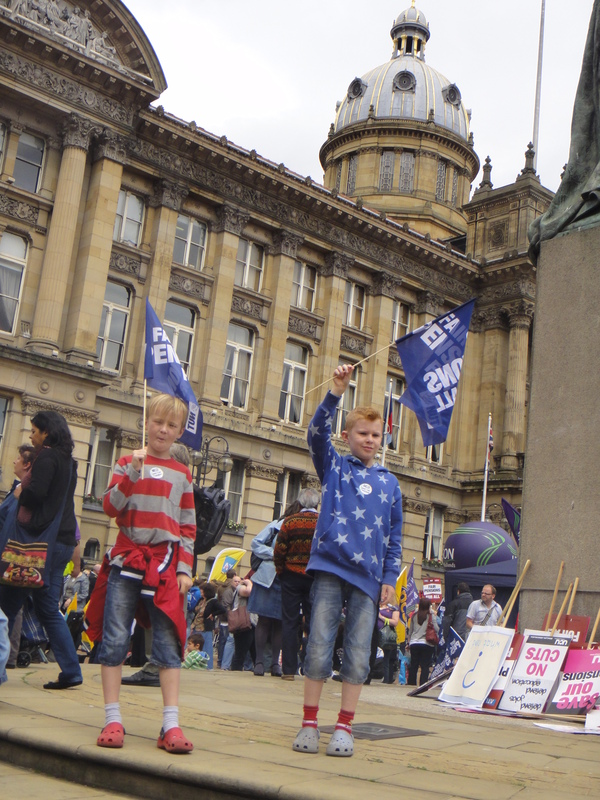 If you are free in the morning, come and Welcome Nick Clegg to Birmingham as a warm-up for Thursdays huge rally. If you’re free in the afternoon, you could leaflet a nearby school and talk to the parents about the strike and the rally tomorrow. 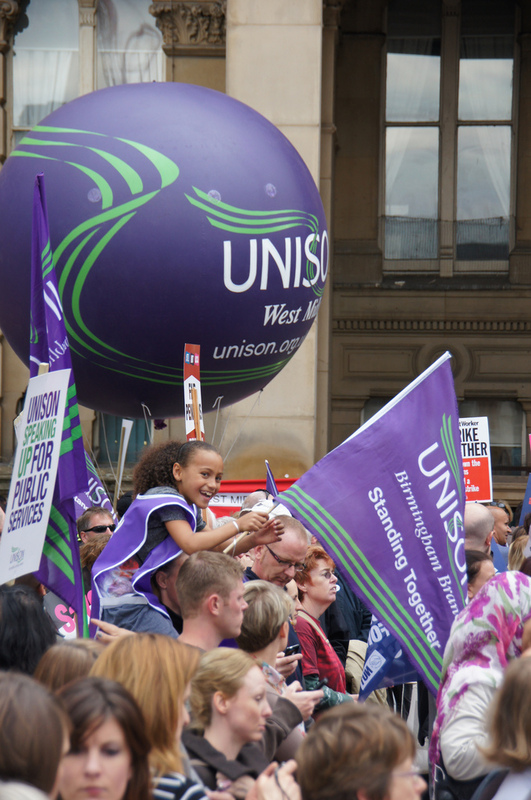 Join a picket then come to the strike rally, 12 noon, Victoria Square.